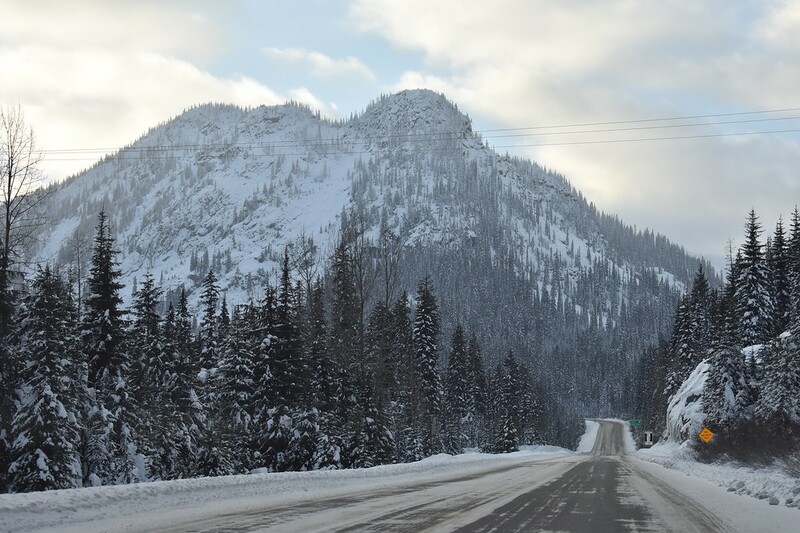 If you love snow, frozen waterfalls, gorgeous mountainous scenery, and friendly people then this two week Western Canada road trip in winter is just for you. When you live somewhere it is easy to take to take your surroundings for granted. Sometimes it takes a fresh pair of eyes to help you see things in a new light. There is so much to explore on this big blue marble of ours and traveling to new and unfamiliar countries can often appear more exciting and appealing than exploring your own country. 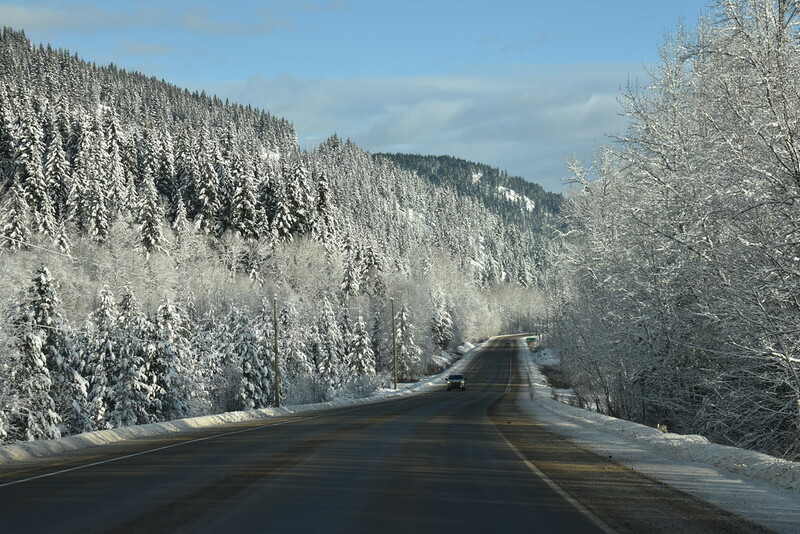 In the fall, Jonas came up with the idea of a two week road trip from Calgary to Vancouver and back – in winter. Jonas had previously traversed between Vancouver and Calgary with friends from home and with parents who came to visit him. 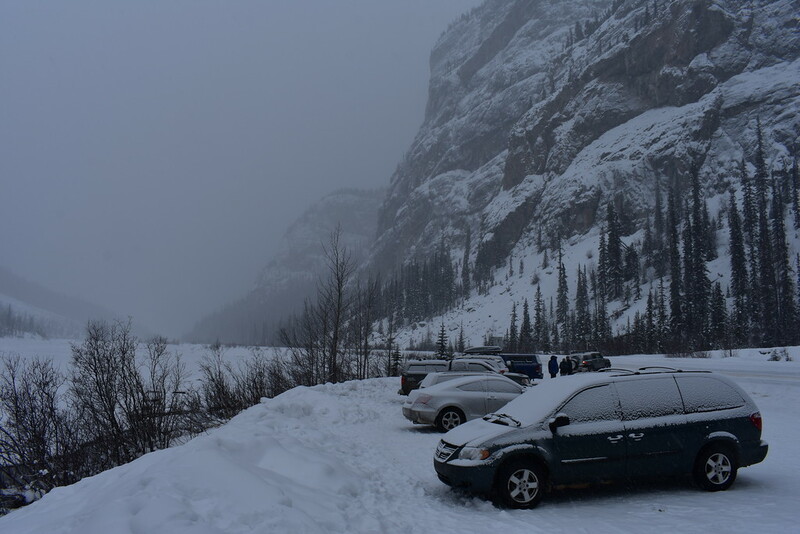 So naturally it was our turn for an epic road trip traversing across mountainous Western Canada. This two week self drive Western Canada road trip itinerary begins and ends in Calgary. 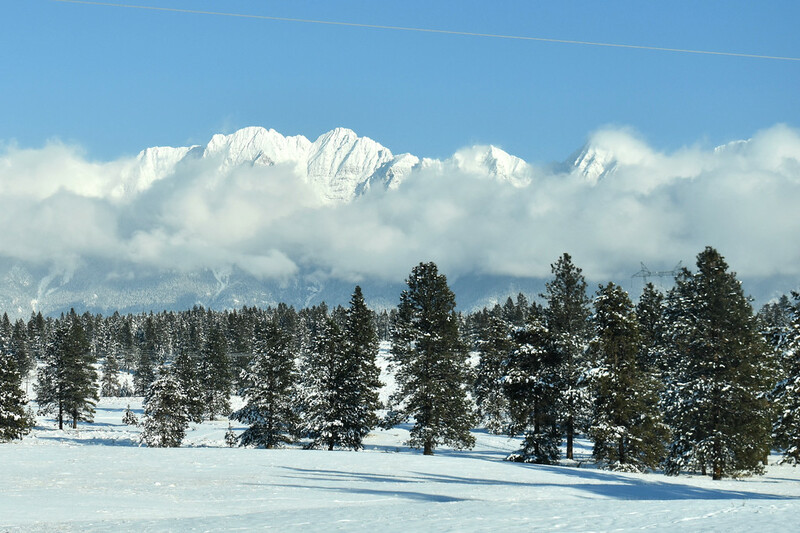 Depending on how much time you have, you can follow the loop we have set up or follow one of the two paths ripe with adventure and epic scenery between Calgary and Vancouver that we have outlined. 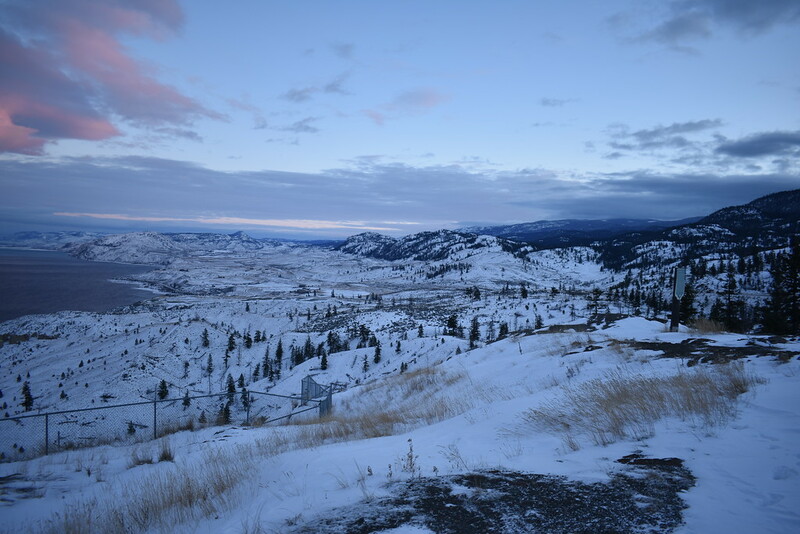 Since we chose to do a road trip in winter between Calgary and Vancouver, we stayed at hostels and hotels along the way. 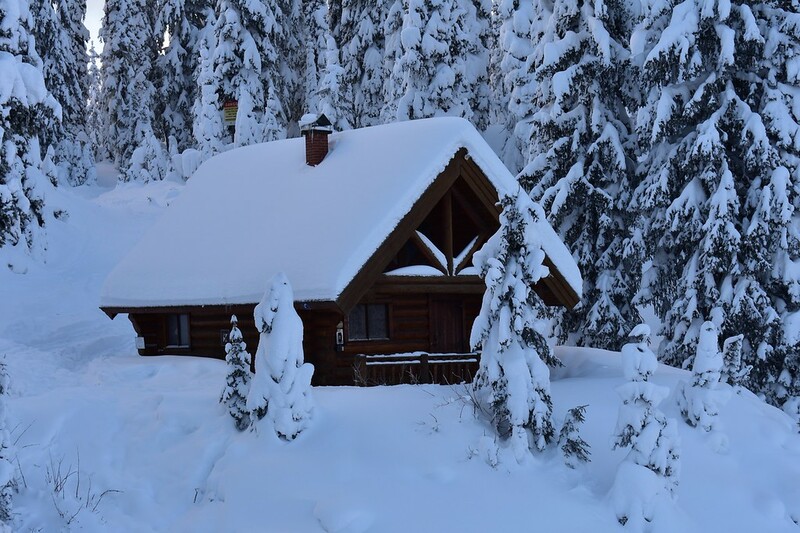 Camping is not recommended unless you are have winter camping equipment. Our advice is to spend at least a week making your way from Calgary to Vancouver or vice versa. The longer you have the better. 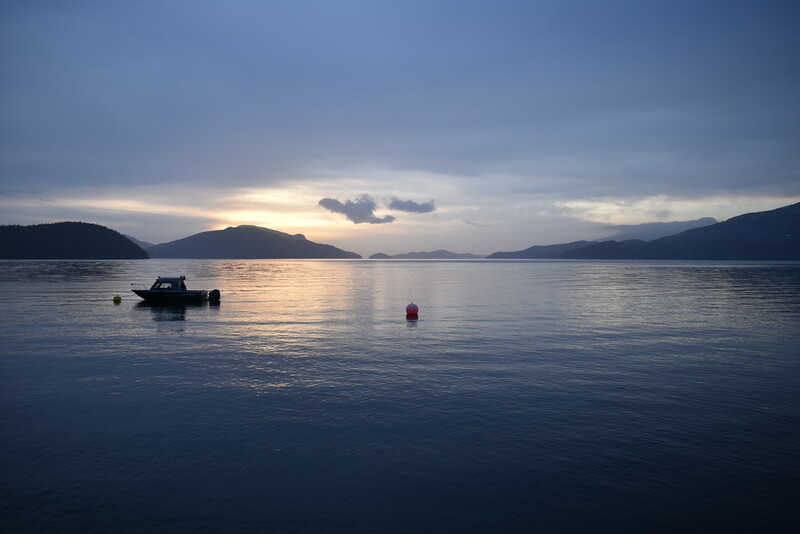 You will want to pull over and savour the gorgeous views along the way. This two week Western Canada road trip itinerary through British Columbia and Alberta is made freely available to you. Save it, share it, pin it! 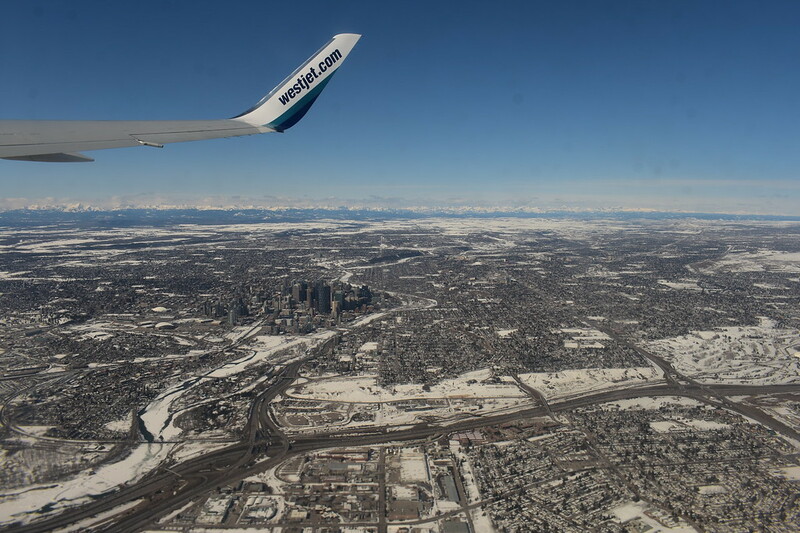 We start our journey in Calgary, known for its status as the host city for the 1988 Winter Olympics and the “World’s greatest outdoor show”, the Calgary Stampede, held annually for 10 days in the beginning of July. We affectionally refer to our lovely city as Cowtown (don’t laugh!). The start of our journey takes us down South through the Albertan Prairies, then West into the interior of the British Columbia to the lovely town of Nelson, and further West to Vancouver, an active, bustling city oft named as one of the most livable cities in the world. 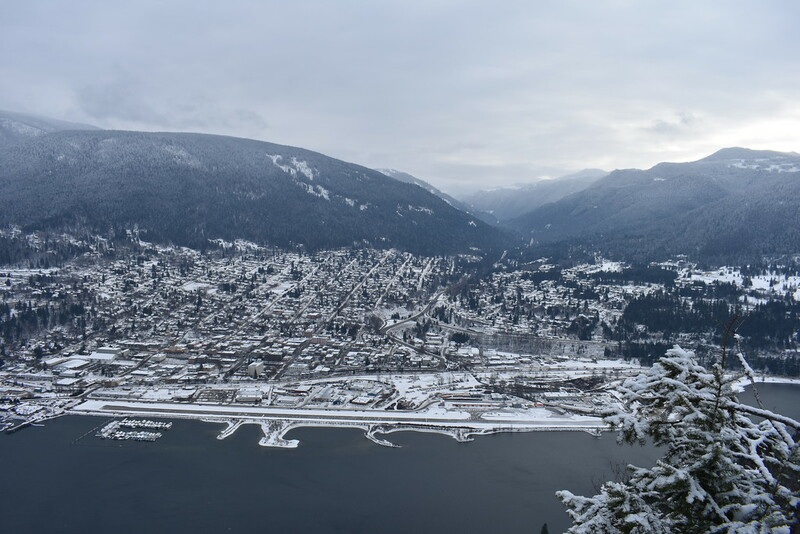 From Vancouver we head North along Highway 99 or the “Sea to Sky Highway” with views of beautiful Howe Sound to reach laid back Squamish and more snow than you know what to do with in the resort town of Whistler. After Whistler we traverse a windy mountainous road with stunning landscapes on our way to Kamloops and Wells Gray Provincial Park for one of the most amazing waterfalls in Canada. 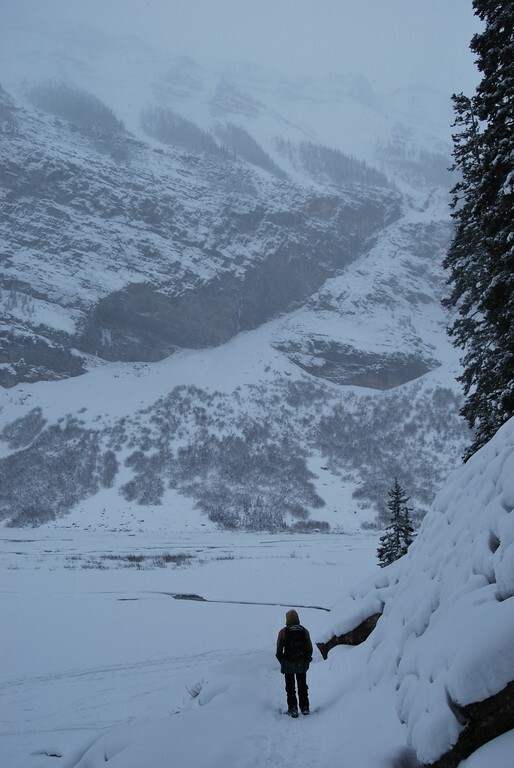 Finally we journey into the Canadian Rockies. 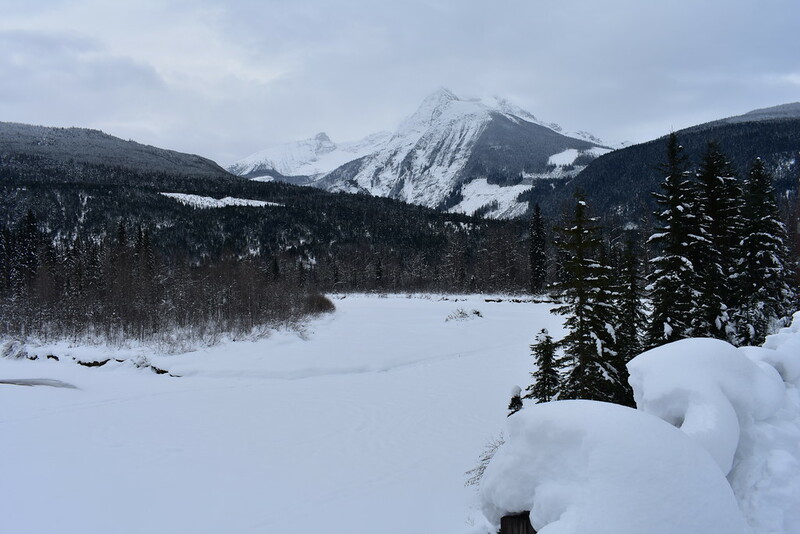 Admire Mount Robson on your way to Jasper National Park where we base ourselves for a few days. 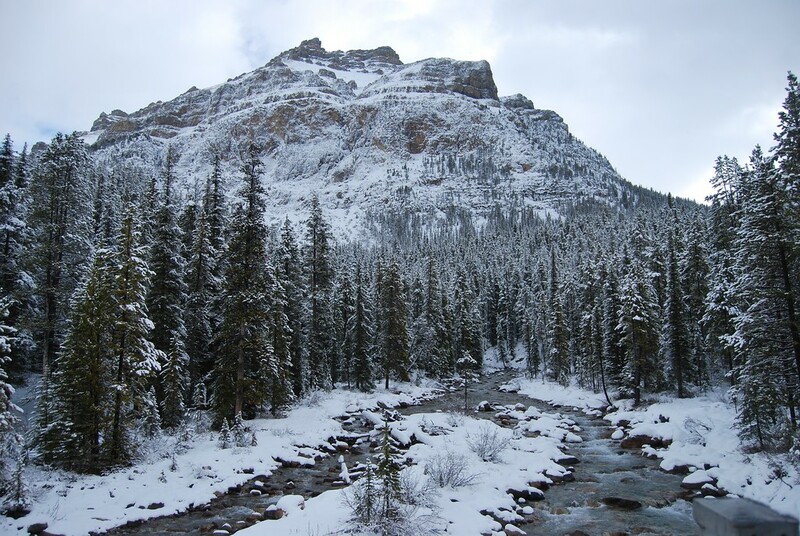 Then return back to Calgary on the visually overpowering and remarkable Icefields Parkway. This itinerary is based on a two week trip covering more than 2550km. This trip could easily be extended for an additional week by breaking up the journey between Calgary and Nelson with a few nights in Fernie or staying in Osoyoos rather than heading straight between Nelson and Vancouver. 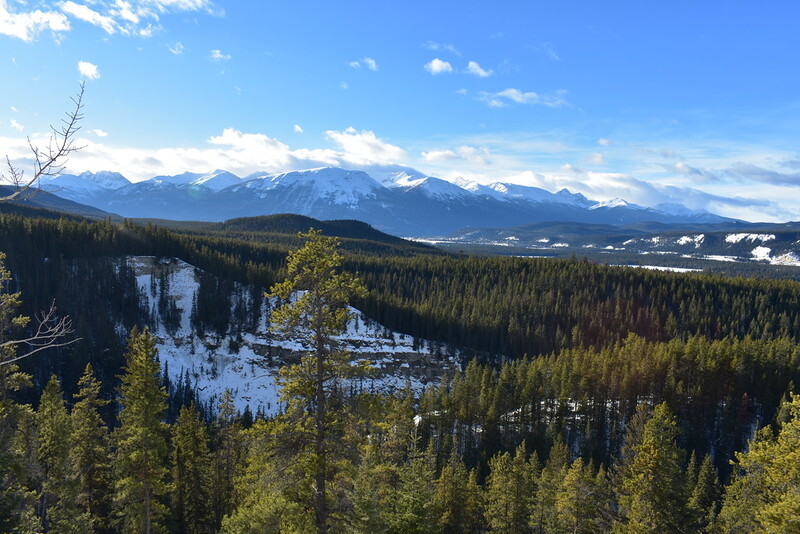 Additionally you may find yourself pulled towards the draw of the Rockies mountains and stretch out your time by another week or two. 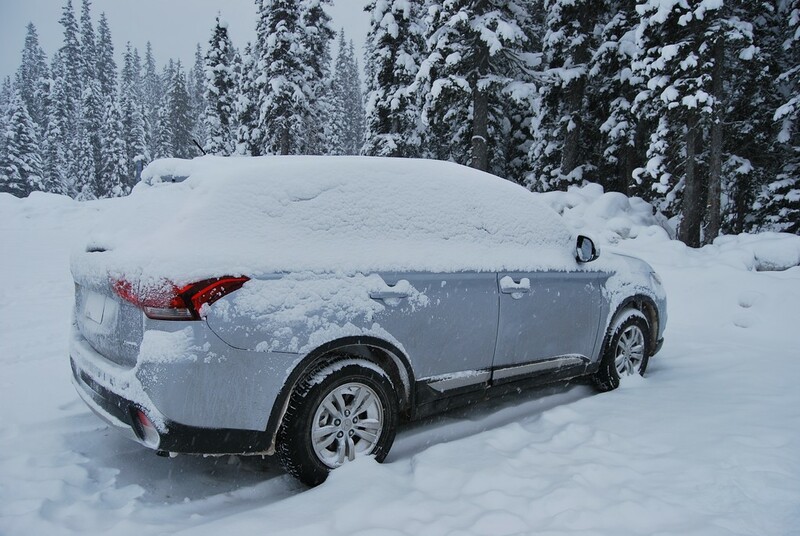 The best car rental option to look for is an SUV with four wheel drive fitted with winter tires. Hire the best car you can afford in winter. 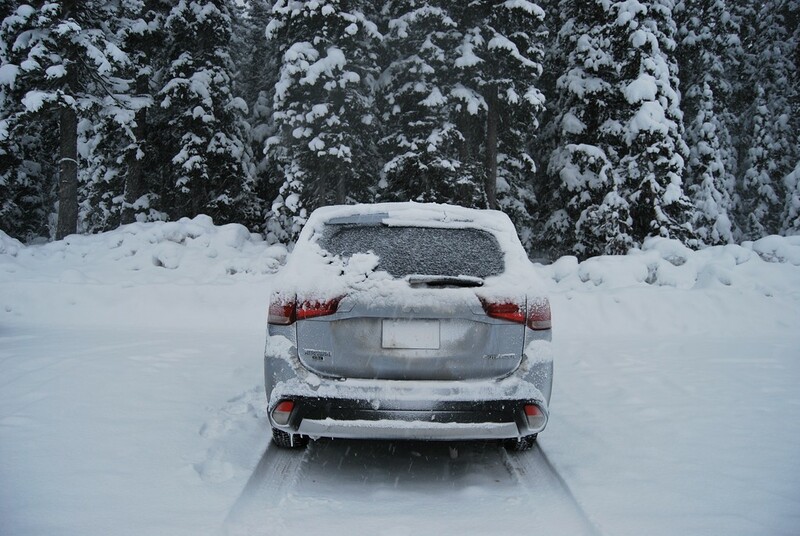 In winter SUVs will usually come with snow and mud rated tires but it is worth it to pay more for winter tires. We have booked with numerous car rental companies in Calgary including Thrifty, Avis, Enterprise, and Budget. 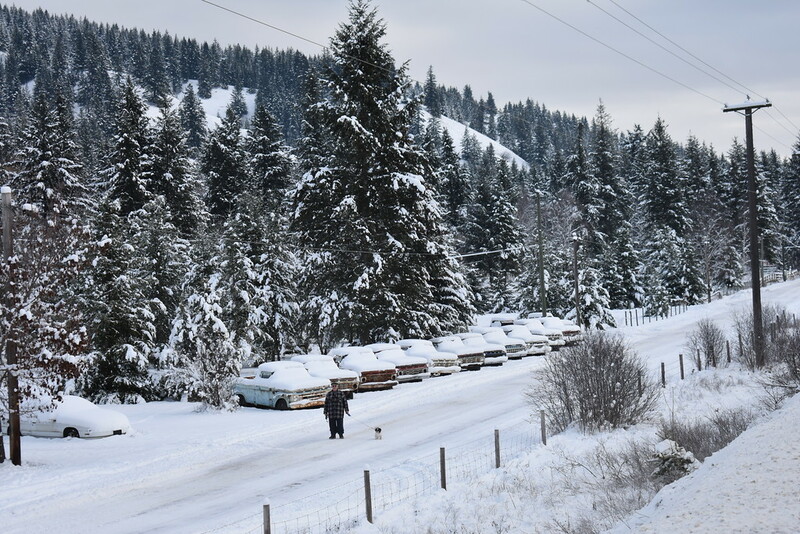 Prices for car rentals in winter rise when the ski season begins. Our trip was planned for mid-December and we booked three weeks in advance. We narrowed our search to Thrifty on Macleod Trail South and called to request winter tires for an additional cost. It is best to book at least one week in advance. Two or three weeks in advance will give you more wiggle room to change bookings and there is more room for negotiation and better deals. Prices will increase either the week before or on the week of travel if you leave it to the last minute. At the time of rental, we declined the insurance offered by Thrifty as we were covered under our American Express card. If your credit card does not cover insurance you could try World Wide Insure, who offer a variety of car rental insurance plans. Driving in Canadian winter requires more precautions than in summer. 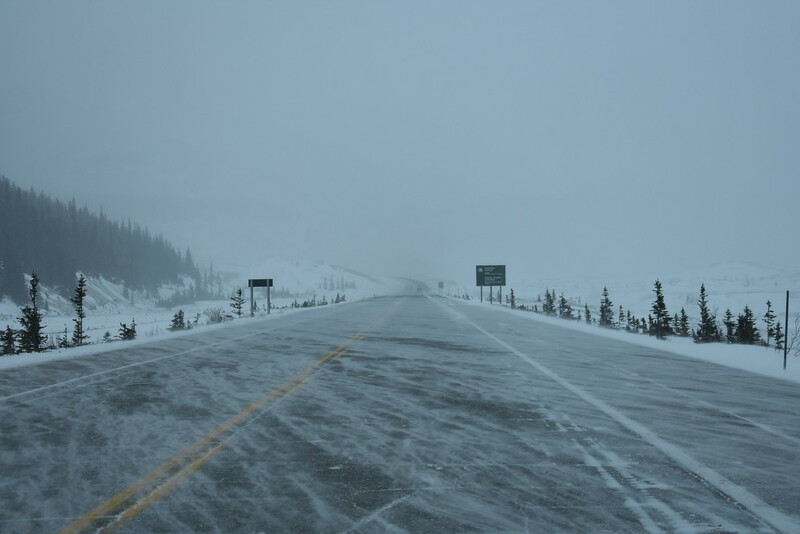 Winter driving conditions in Canada vary day to day with fresh powder, compact snow, icy roads or cleared, gravel overlaid paths. 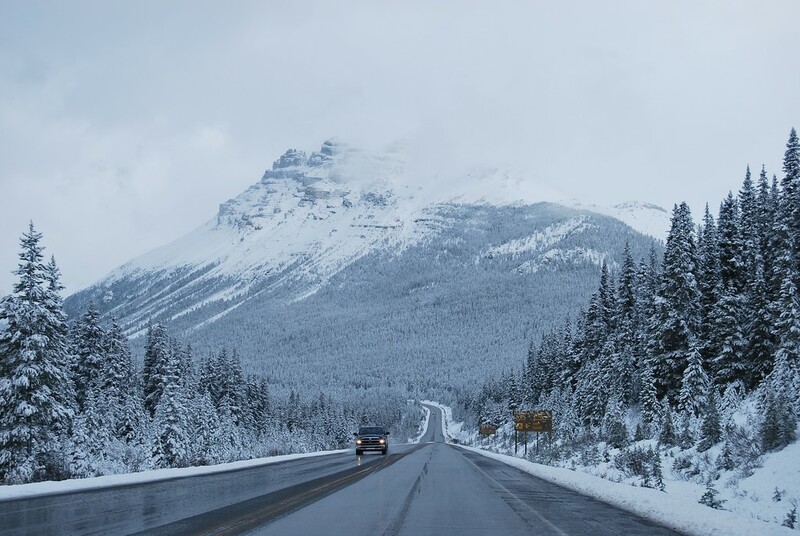 If you are taking a road trip in winter, you should prepare an emergency kit in the event that your car breaks down or you get into an accident. You many have little to no cell service if you are far from a town and it may take a few hours for emergency services to reach you. Bring extra clothing, small bottles of water, non-perishable food stuffs, and blankets or sleeping bags. Pick up your car in Calgary, one of the sunniest cities in Canada and dive straight into the wide, open flatlands of the Albertan Prairies. After you’ve have had your fill of endless horizons dotted with small towns and independent farms it’s time to head into beautiful British Columbia. This is a big driving day so make sure to start bright and early. Drive through Crowsnest Pass, a mountain pass belonging to the Canadian Rockies and situated along the BC-Alberta border. Head West, passing the hulking giant green coal mining truck in Sparwood; it just so happens to be the largest of its kind in the world. Mosey on past the ski town of Fernie and industrial Cranbrook en route to Nelson. 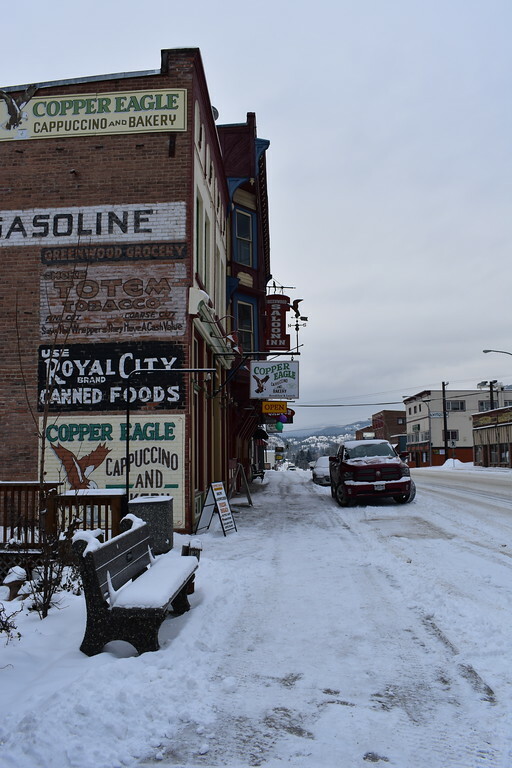 Just before reaching your destination of the day take a break in Salmo, a former mining town with 19th century old Western town buildings. Check out more photos in our Calgary to Nelson post here. 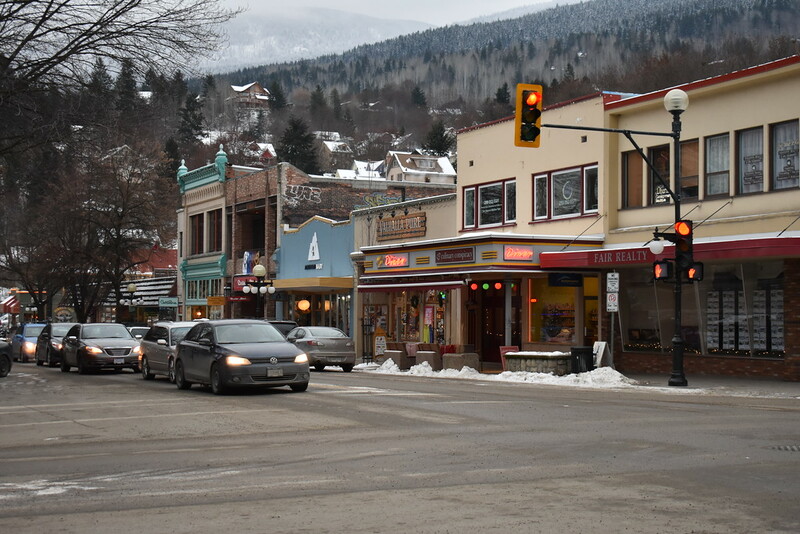 Take a day to wander through the city of Nelson, nestled in between the Selkirk mountains and the shores of Kootenay Lake. 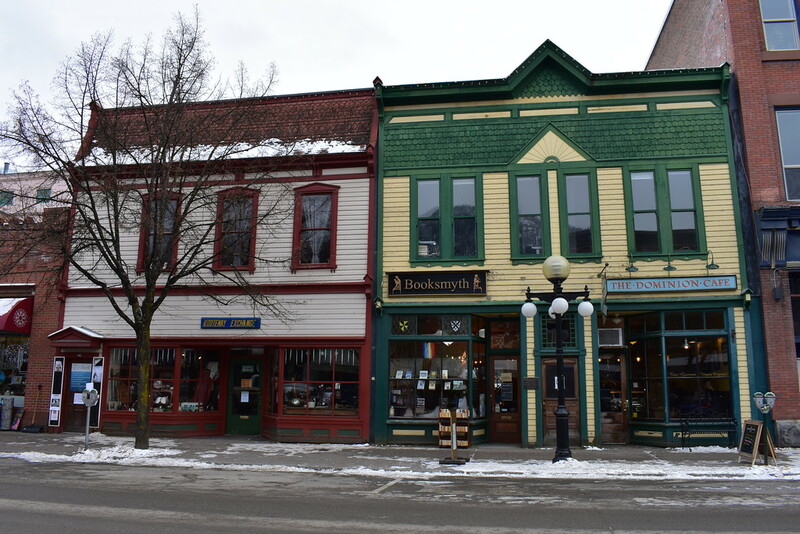 Nelson is known as the “Queen City” boasting more than 350 well preserved and restored heritage buildings, many of which can be observed along the main downtown shopping area of Baker Street. Nelson is a gem to explore, with an active arts and culture scene, cozy restaurants, laid back coffee shops, breweries, and friendly locals. 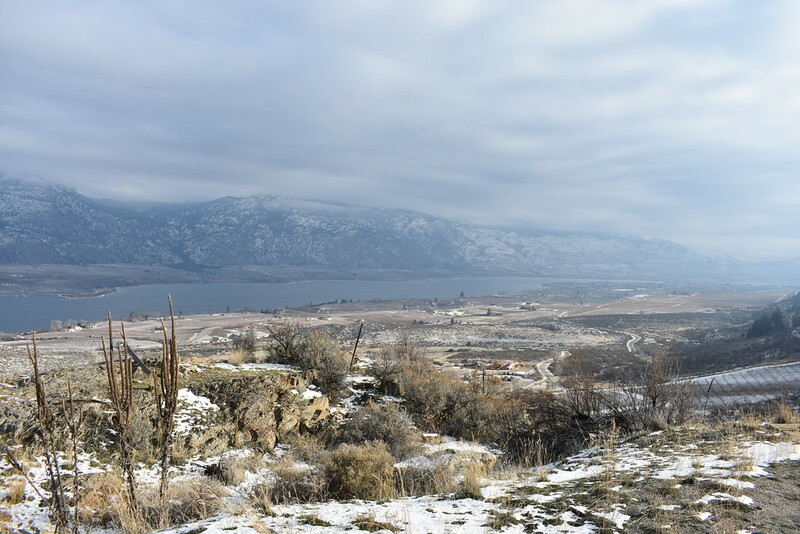 Hike the Pulpit Rock trail for a bird’s eye view of the hilly city below nestled in the valley. The hike is 3.2km round trip with 330m elevation gain. The trail can be icy in winter so it would be advisable to rent a pair of ice cleats in town. End your day by the marina on Kootenay Lake. The wind adds to the chill so make sure to bring layers and a hot drink. From Nelson take the highway 3A out of town until it turns into Route 31 (Balfour-Kaslo-Galena Bay Highway) after the community of Balfour. 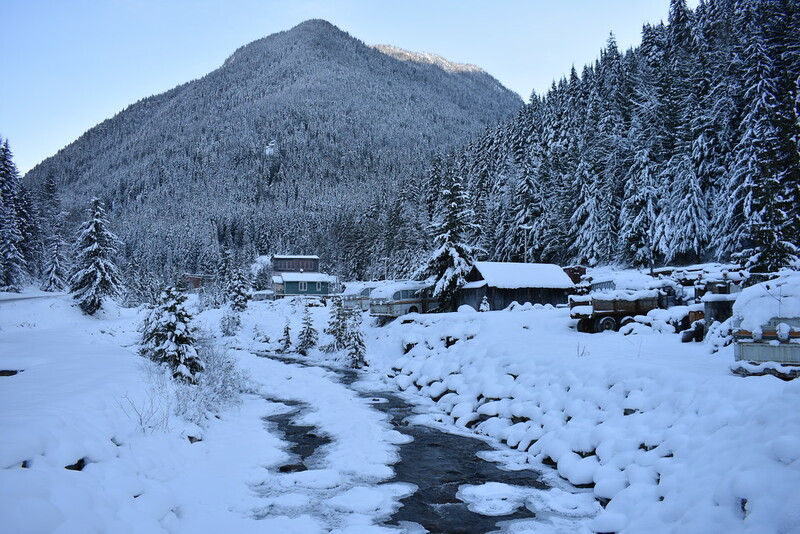 For a little rest and relaxation, head to Ainsworth Hot Springs. 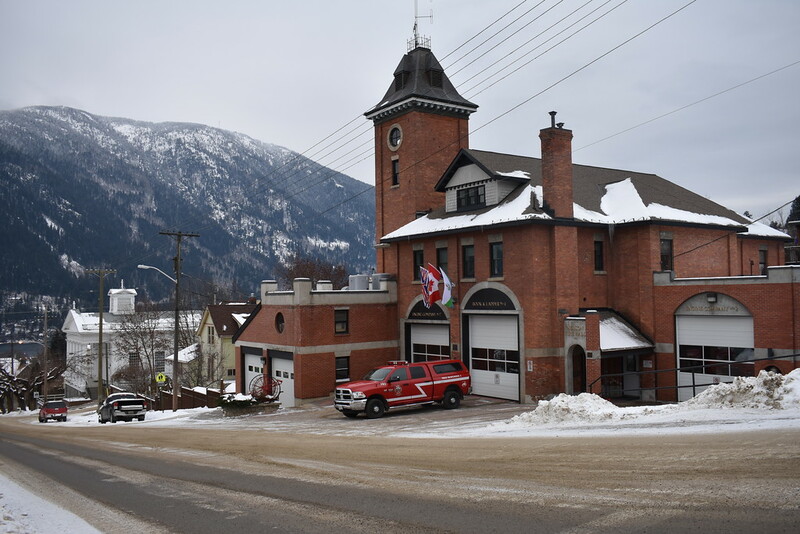 Otherwise, continue North along the Western shores of slender Kootenay Lake and arrive at the former silver mining village of Kaslo. 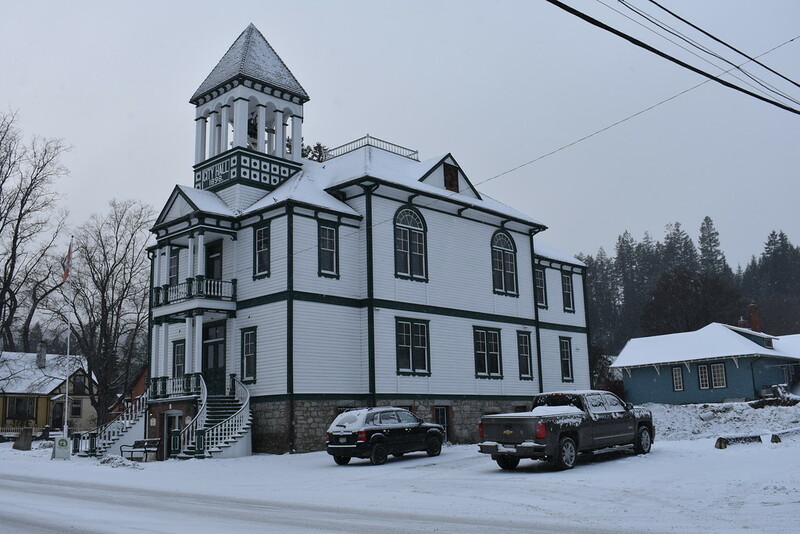 This tiny village happens to include two National Historic Sites: the SS Moyie, the oldest intact sternwheeler in the world and the late 19th century built wooden Village Hall building, still in use today as a municipal government office. 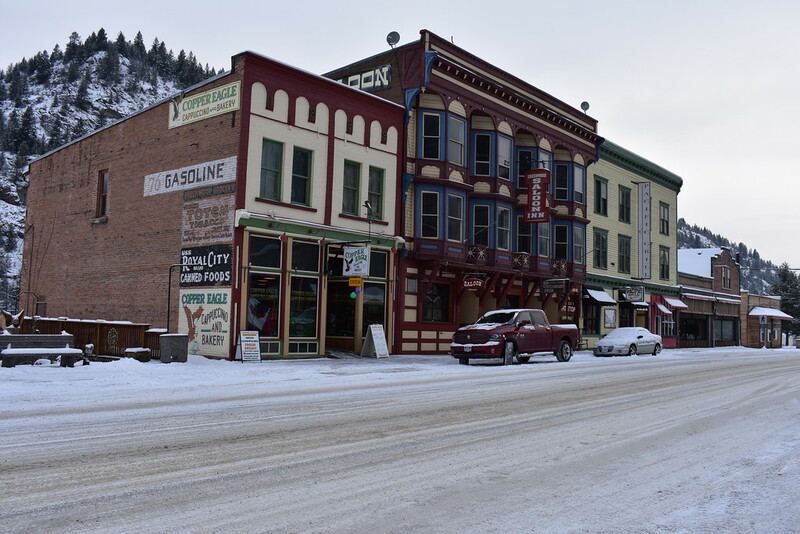 The main street in town is Front Street, dotted with a few old Western style buildings. 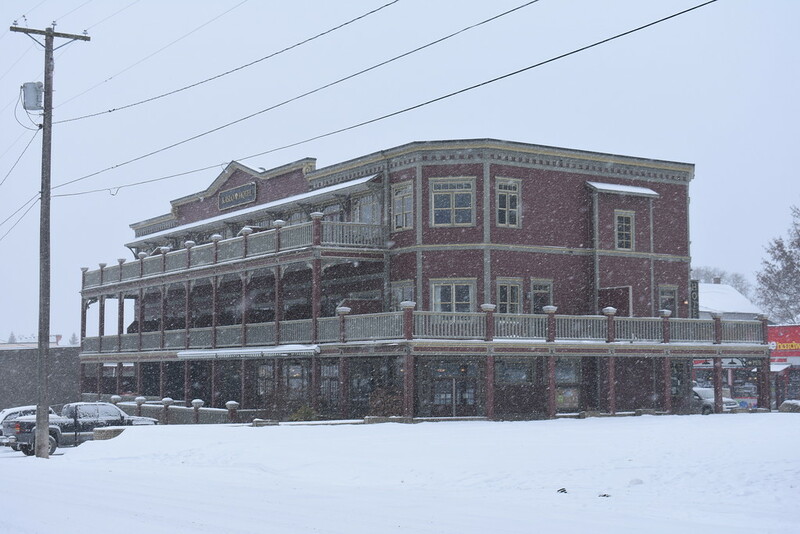 Interestingly, the original Kaslo Hotel & Pub on Front Street built in 1896 housed interned Japanese Canadians during WWII. It dilapidated structure was burnt and rebuilt in the 50s. 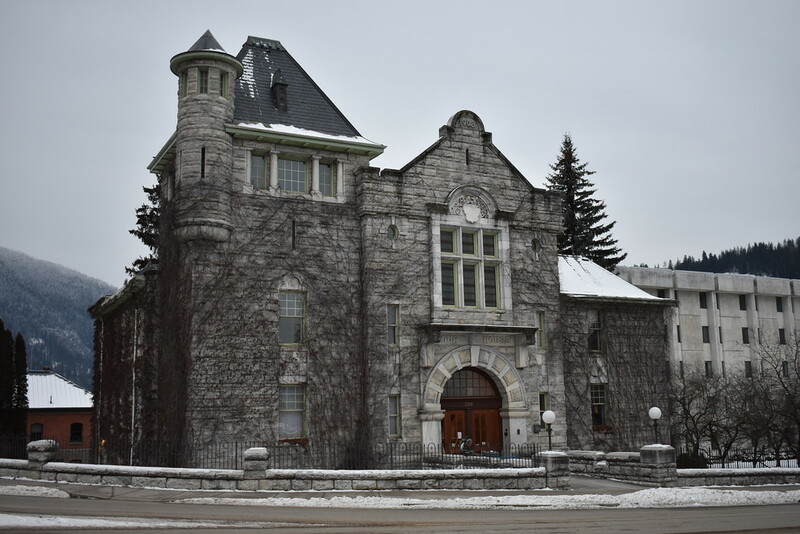 As a way of trying to make up for this darker side of Canadian history, they offer two nights complimentary stay to any Japanese Canadians who were at the hotel during WWII or had ever stayed in the original building. 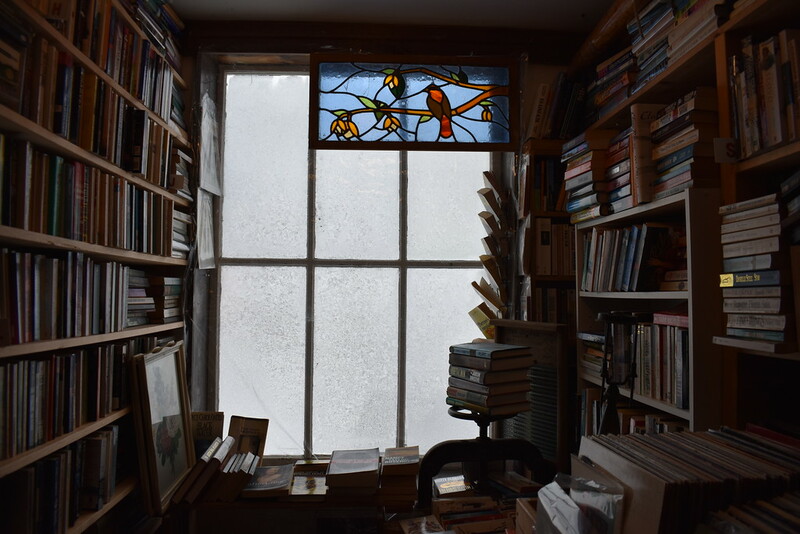 Our favorite little find in Kaslo however, was the tiny bookstore crammed floor to ceiling with books and maps across from the SS Moyie and housed in the 1896 Silver and Books building. 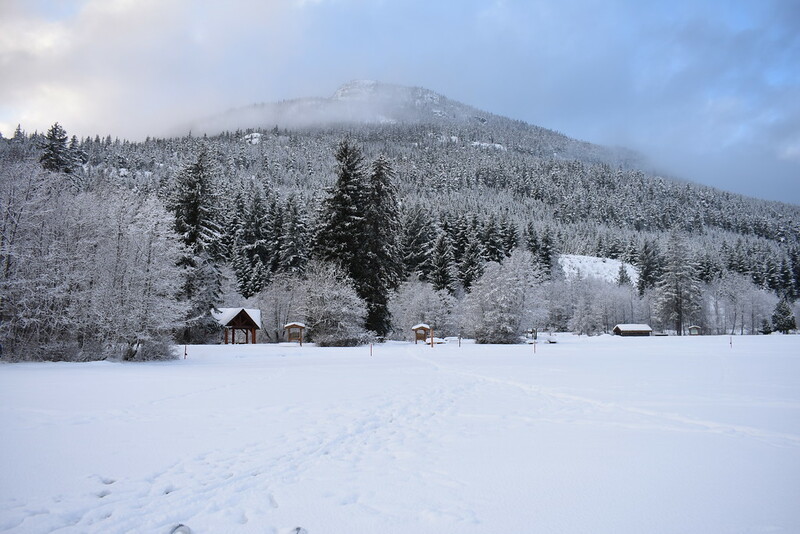 You could spend all day relaxing and warming up in Kaslo and returning to Nelson or you could continue exploring the beautiful Kootenays. Sandon Ghost Town Take road 31A out of West out of town. Drive through the silent forest, blanketed with a few layers of snow. 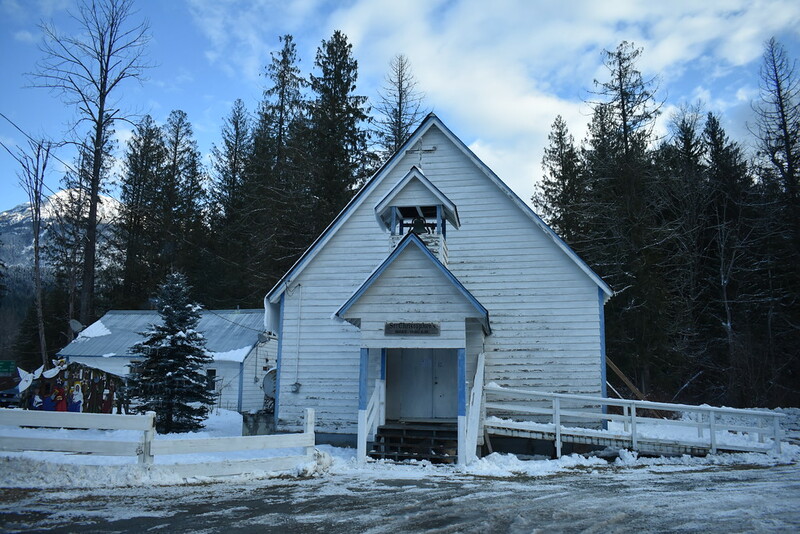 About 37.5km from Kaslo, turn onto Sandon road to reach the ghost town of Sandon. 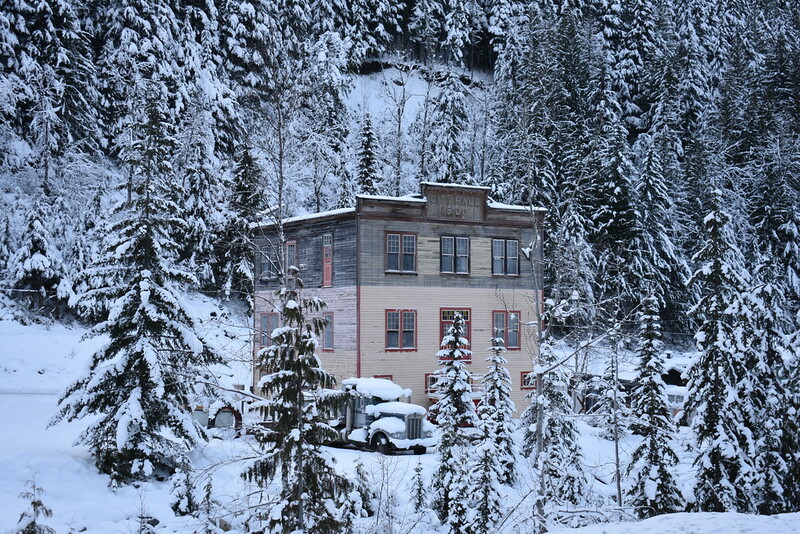 Formally a booming silver mining town of over 5000 residents, Sandon shrunk as the price of silver depreciated. And in 1955, a flood occurred and destroyed a number of the buildings. These days only a handful of residents and their children still live and play in the snow in Sandon. 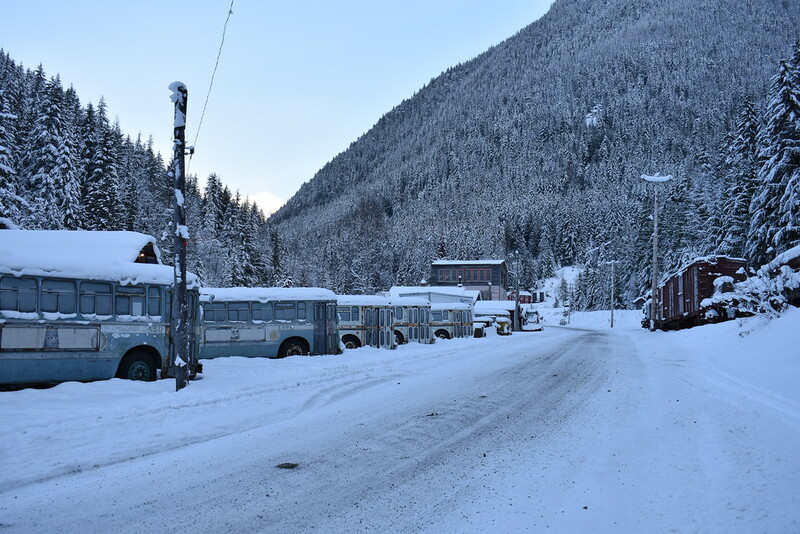 Other than the residents, there are a few heritage buildings left and a disposed fleet of buses rusting away in this ghost town. 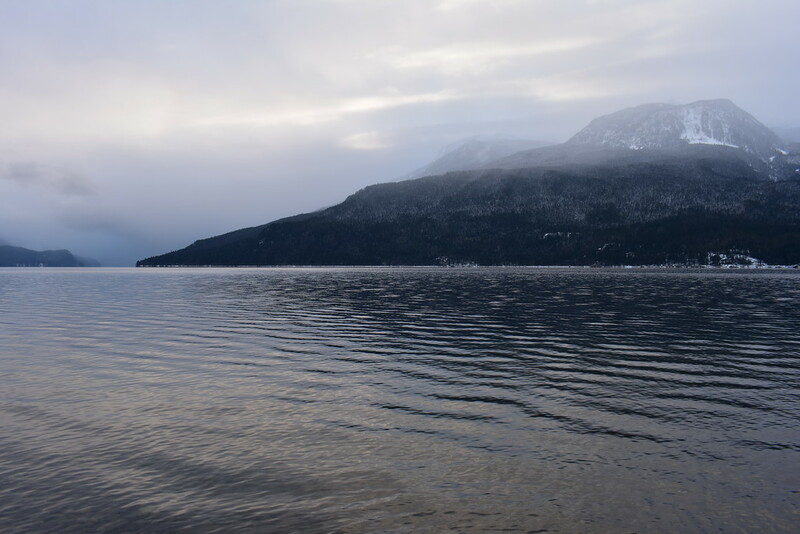 Before heading back to Nelson, if daylight permits, consider visiting the Slocan lake shore along New Denver for a view of the Selkirk mountain range in Valhalla Provincial Park. 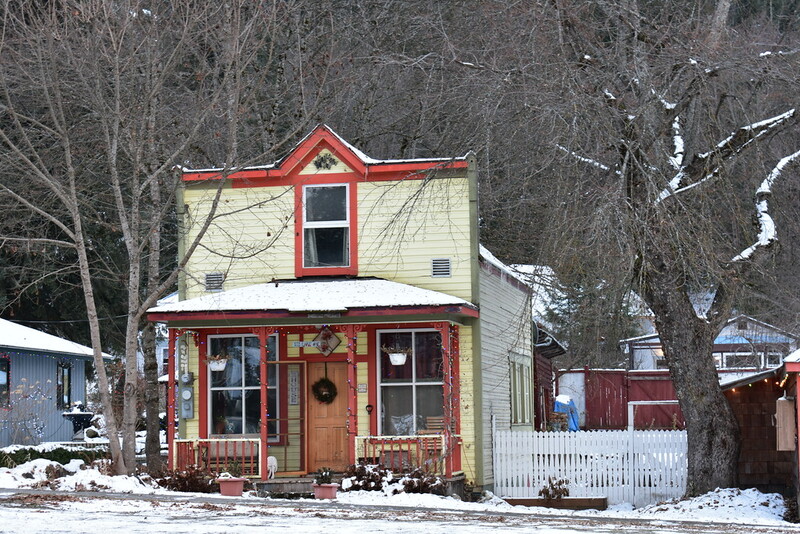 A few minutes South of New Denver lies the cozy, festively decorated village of Silverton. Time to return to Nelson along Highway 6. From Nelson to Vancouver we have a long day ahead ahead, 659km or 7.5 hours of driving through West through the coastal mountains in interior British Columbia along Highway 3 then TransCanada Highway 1. Given the limited daylight hours in winter, this will be a driving day. 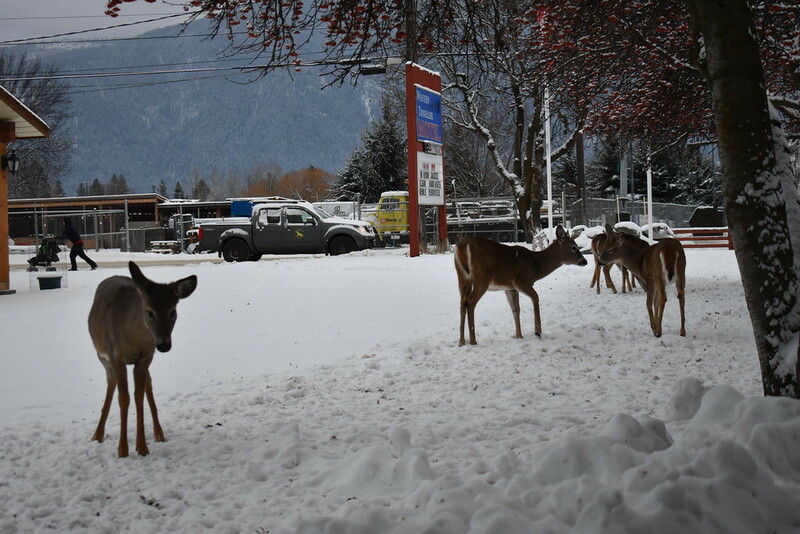 Keep your eyes peeled for deer and goats along the highway or when filling up the gas in your tank. Occasionally you may catch a glimpse of the odd ice fisher or two here and there. 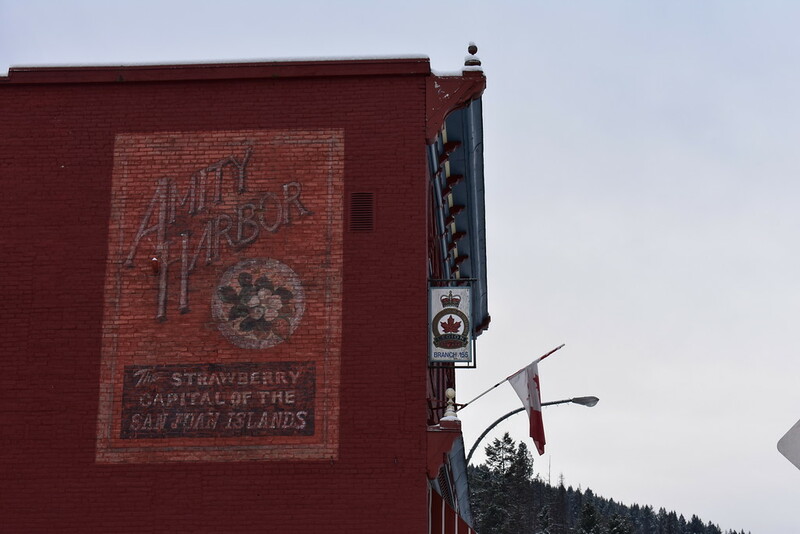 Stretch your legs in Greenwood, a quiet former mining town with colorful brick and wooden storefronts and Christina Lake, which has the warmest tree lined lake waters in Western Canada and popular with families and water sports in warm weather. Continuing West on Highway 3, if you looked at a map you would see that the road is at times only a few hundred metres further away from the Canadian-American border. If you had your paperwork and visa in order you could cross over and briefly visit a small American town and take advantage of the cheaper gas and groceries our Southern neighbours enjoy. 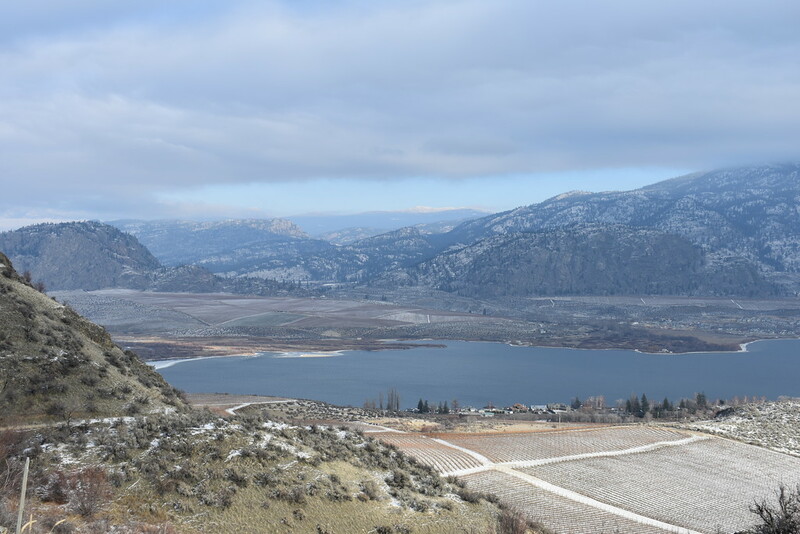 The views approaching and departing the town of Osoyoos, nestled in the Okanagan Valley around Osoyoos Lake, are wonderful. 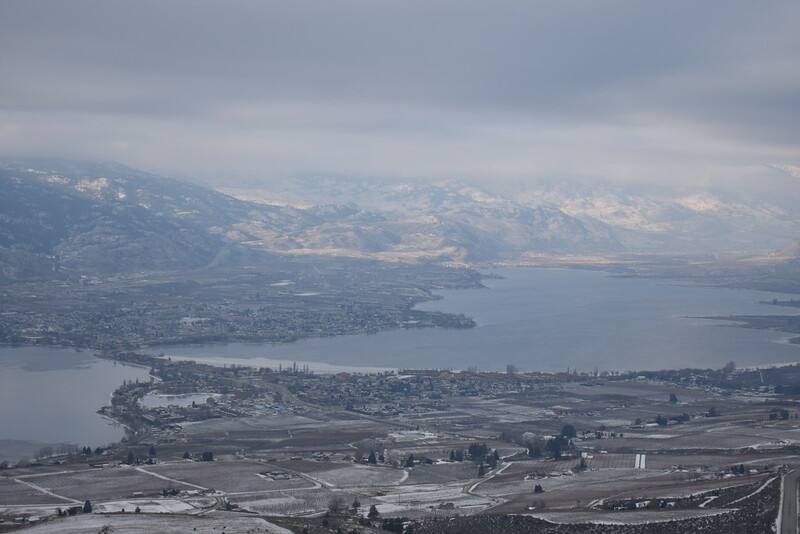 The Okanagan Valley is known in Canada for its milder climate and wine yards. 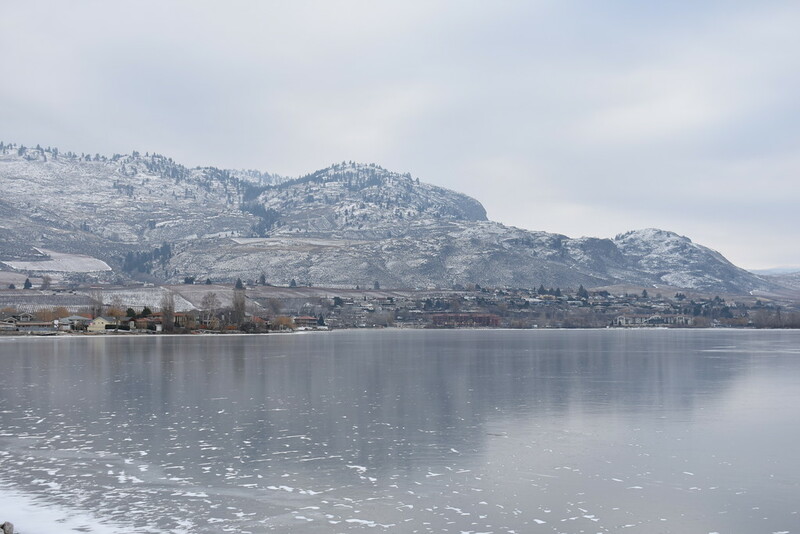 Osoyoos Lake is shared by Canada and the United States so when you face South across the Osoyoos Lake you are actually looking into the U.S. 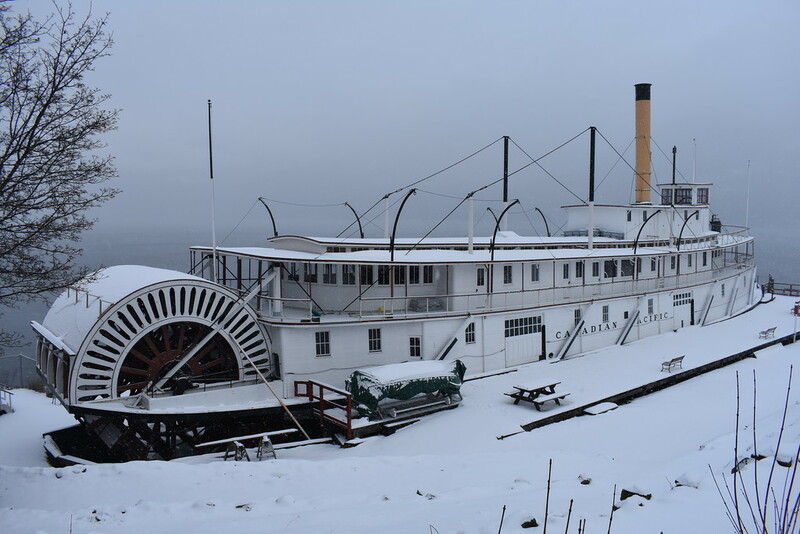 This is similar to when we visited Waterton Lakes in winter, which we have covered in a separate post. 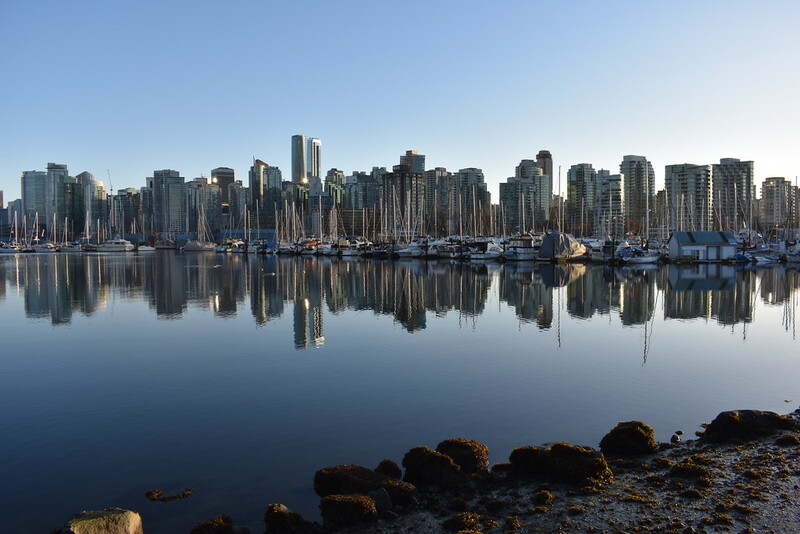 Vancouver is one of Canada’s most culturally rich, ethnically diverse, and physically active cities. It would be easy to spend a week based in Vancouver, exploring the city and doing day trips but since we’re on a road trip we can’t stray too far from our mighty chariot can we? 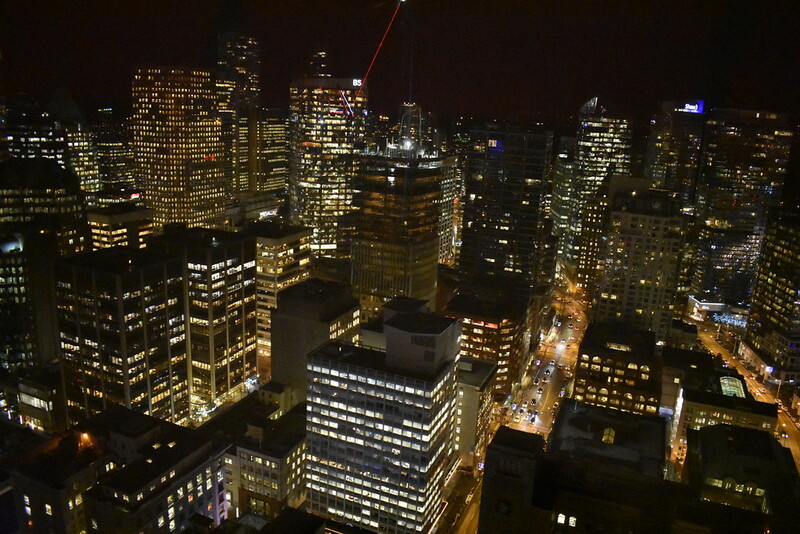 Be sure to get a day pass to the Vancouver tower so you can go twice, first during the day then back at dusk when the sun goes down and the city lights up. The elevator ride alone is neat, as you can watch the city go by as you ascend. Tell time with the help of the Gastown Vancouver Steam Clock and stop for a bite to eat or drink in hip neighborhood chock full of eateries and pubs. And maybe pick up a maple leaf shaped glass container filled with maple syrup from the tourist shop nearby. A sweet little gift to give away or keep for yourself. 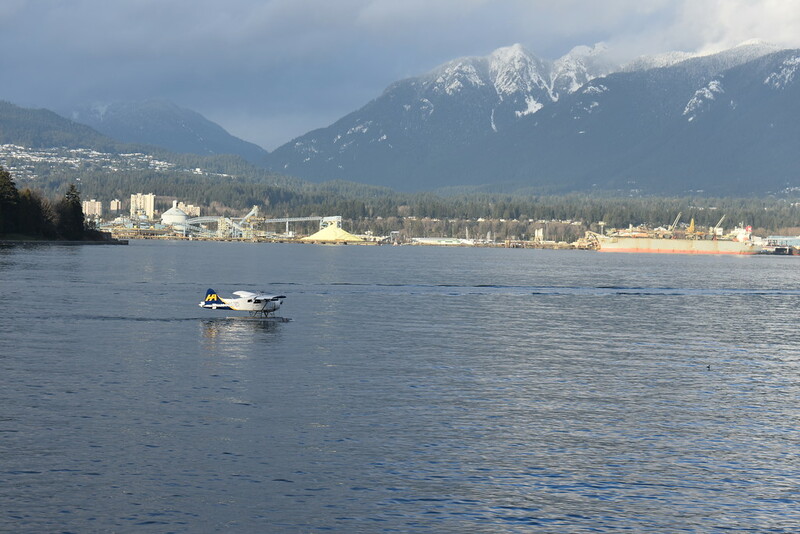 Walk or bike around Stanley Park along the Vancouver Seawall. Pause to take in the reflections of the skyscrapers and boats in the marina. 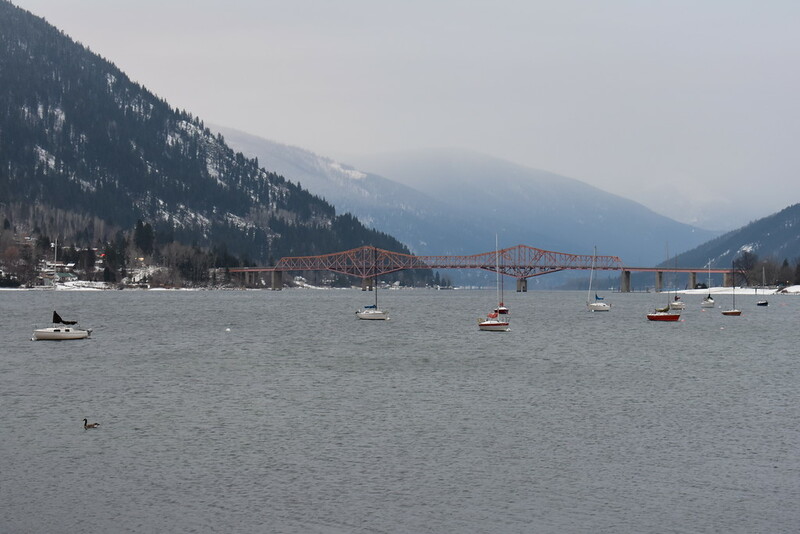 Other points of interest include the totem poles, the Lions Gate Bridge, and Siwash Rock, and Third beach. If you are so inclined, continue on to English Bay Beach and Sunset Beach Park. 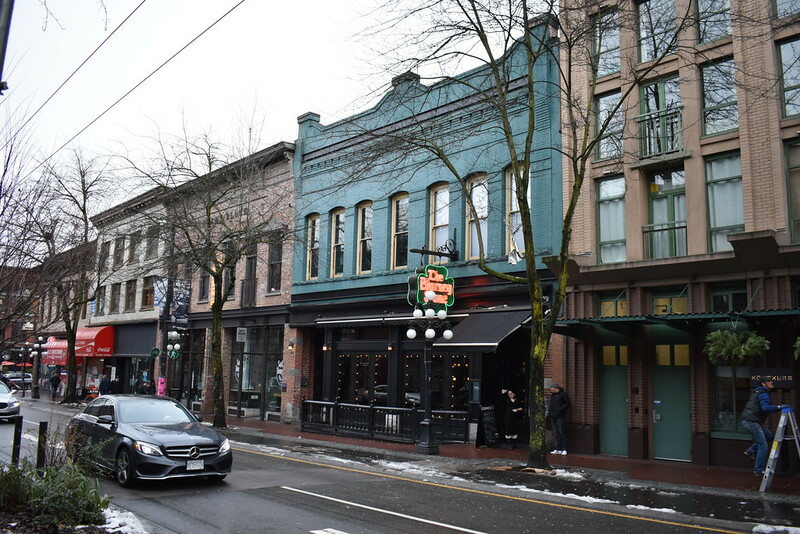 Other notable neighborhoods to shop, drink, and people watch in are Yaletown and Granville Street. And a trip to Vancouver isn’t complete without visiting the marketplace on Granville Island and the domed Science World at TELUS World of Science. Squamish is an hour’s drive North of Vancouver on Route 99, also known as the “Sea to Sky Corridor” that extends between Horseshoe Bay and Whistler. 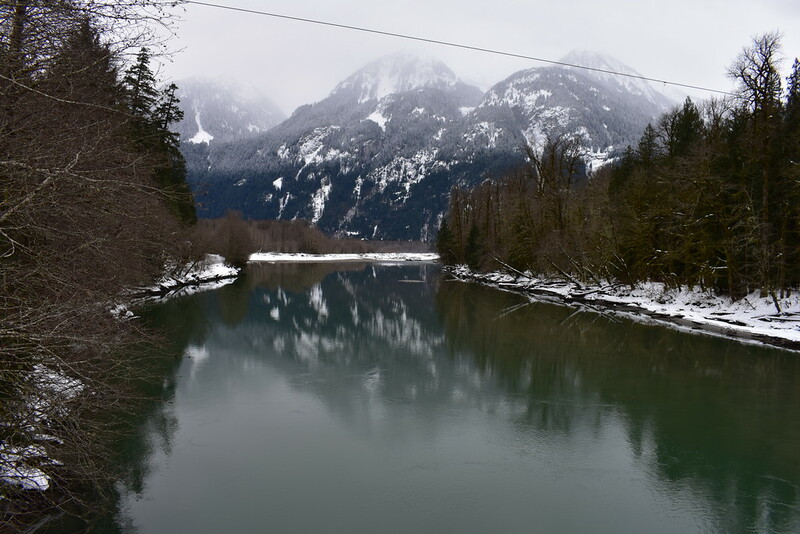 The endpoint of this day is to arrive in Squamish but since you have all day to make this short drive, why not take the scenic route and make a few detours along the way. 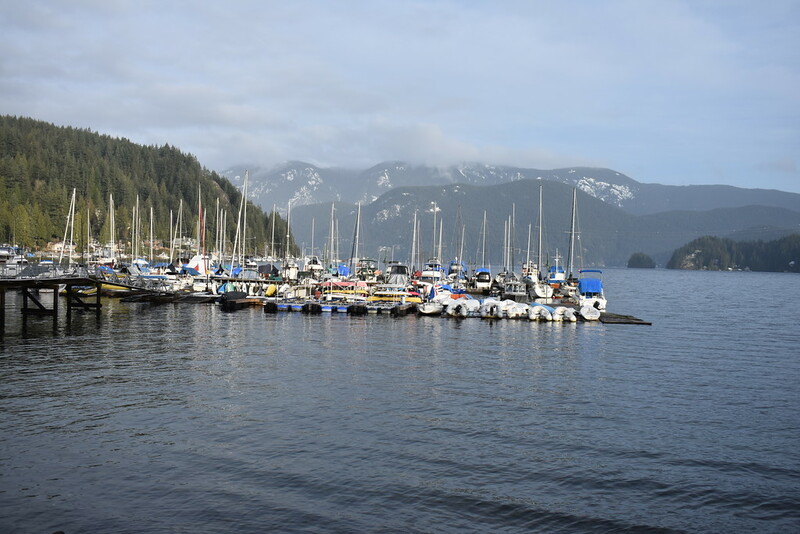 Zoom out of central Vancouver to North Vancouver and its Easternmost community, Deep Cove, which sits at the base of Mount Seymour and faces East to the Indian Arm, an extension of the Burrard inlet. 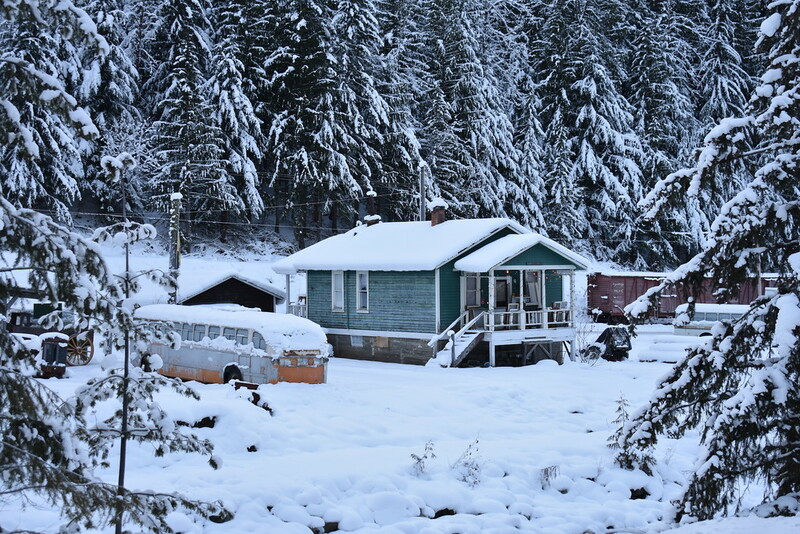 It was also one of the filming locations for the Bates Motel television show. Next up, drive up to the 137m long Capilano suspension bridge or the shorter but free suspension bridge in Lynn Canyon. 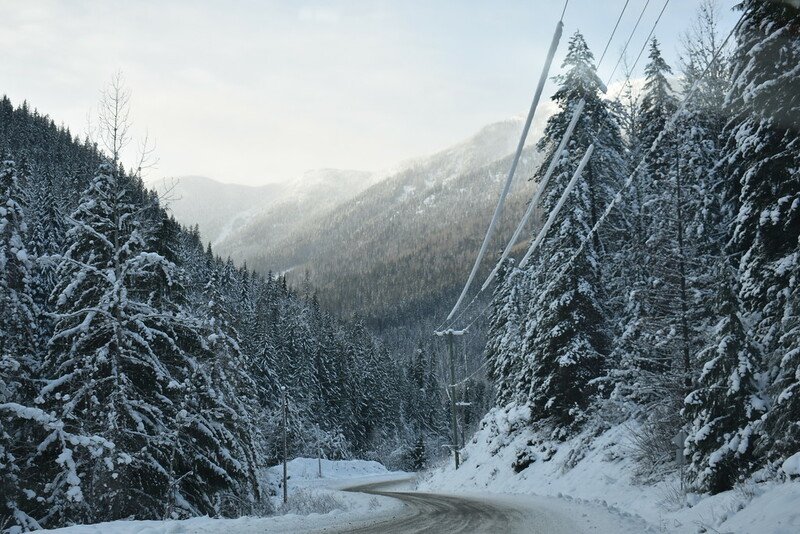 Before making the drive to Squamish, take the Cypress Bowl Road towards Cypress Mountain skifield. 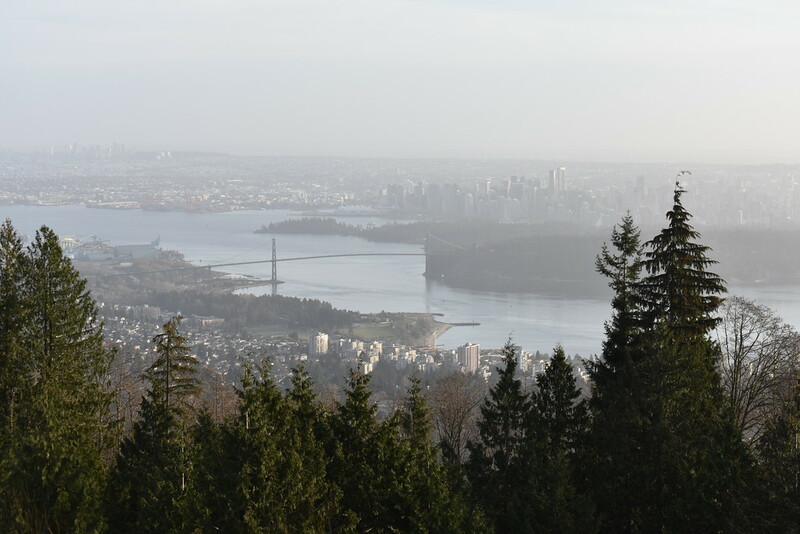 The pull off spots en route to the ski hill provide vistas overlooking Vancouver. 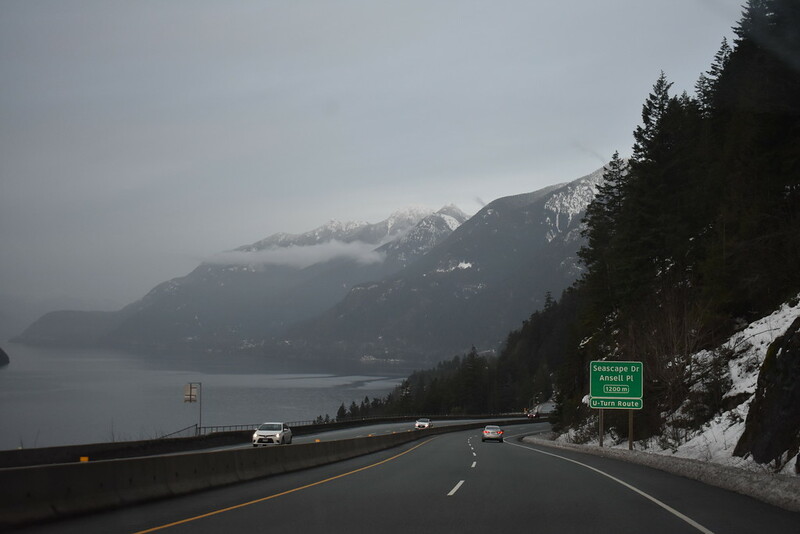 After the detour up Cypress mountain it’s time to return to route 99 and travel North along Howe Sound on the windy coastal road to Squamish. 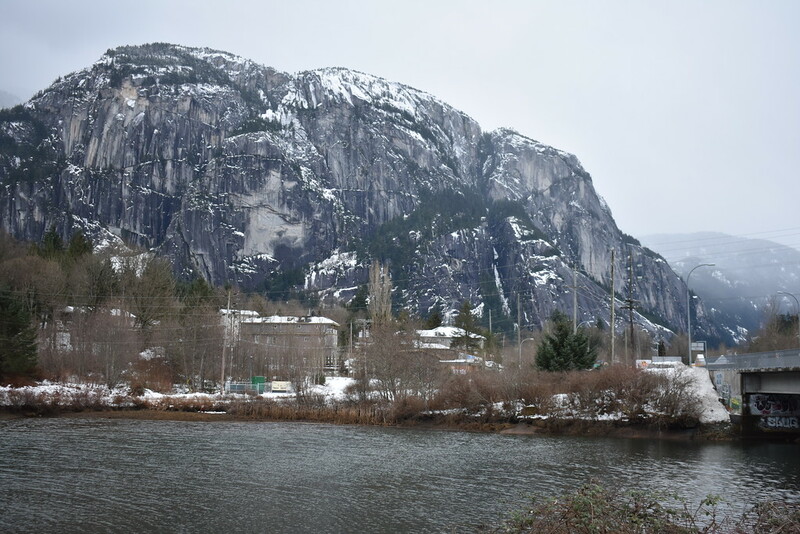 Spend the first half of your day around the small rock climbing town of Squamish. 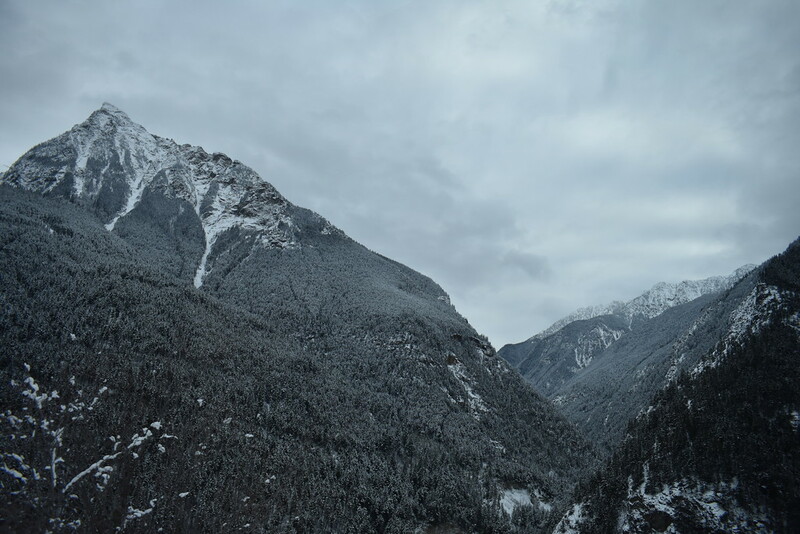 Admire the giant granite cliff face of Stawamus Chief from afar or take the Sea to Sky gondola to the top. Next, head 1km South of the gondola to Shannon Falls Provincial Park. 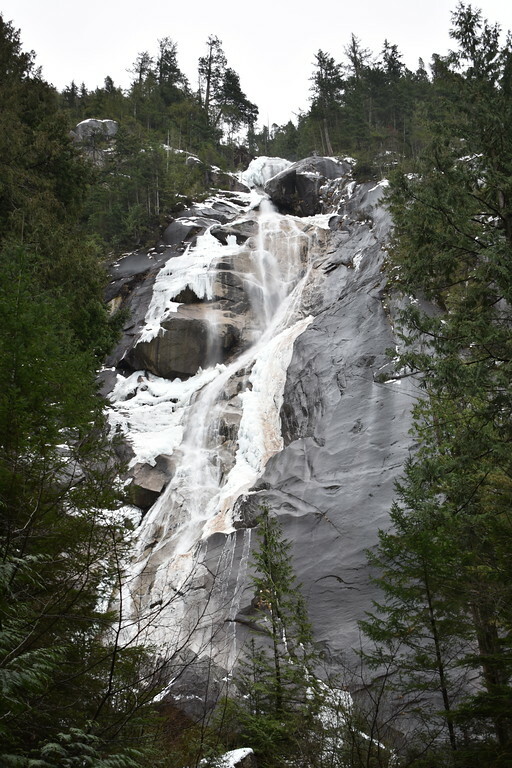 It’s a short walk from the parking lot to the third highest waterfall in B.C, Shannon Falls. 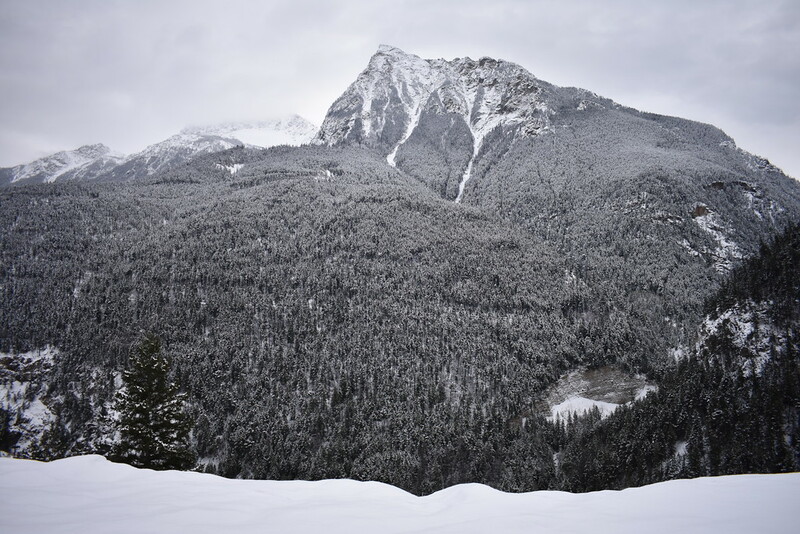 In the afternoon, head over to Whistler, which sits 665m elevation higher than Squamish. 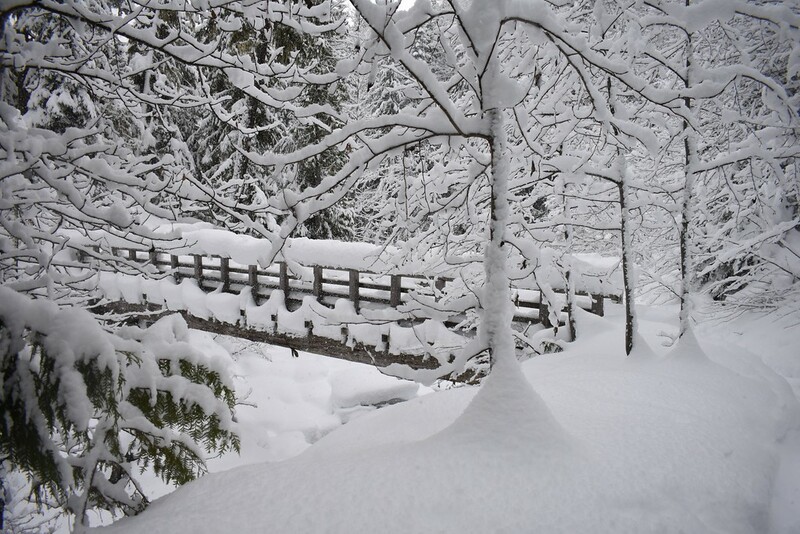 In just half a hour the scenery transforms from rain and slush to several metres of snow. 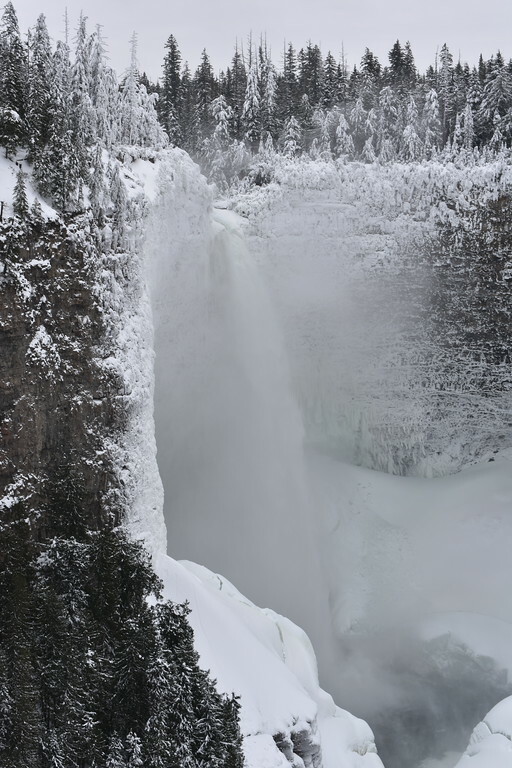 Along the way, stop at Brandywine Provincial Park and go for a short walk or snowshoe to the viewing platform above Brandywine Falls. 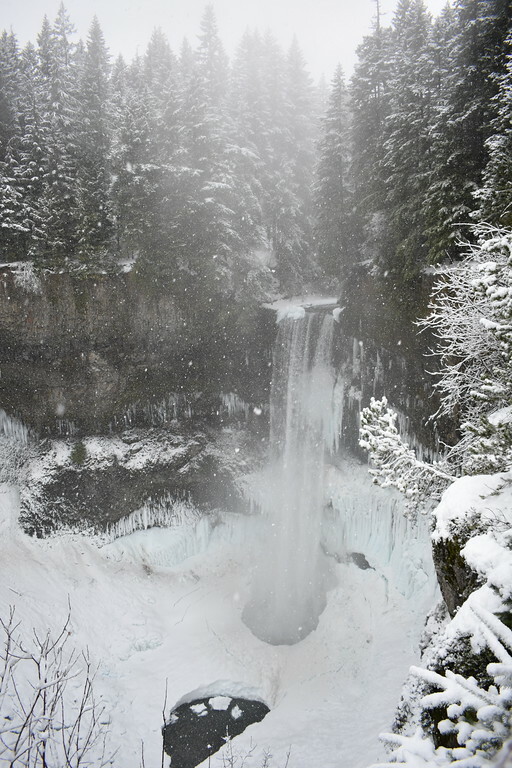 Depending on the temperature, Brandywine Falls may be partly frozen, at the very least the trees nearby will be coated in ice from the freezing of water spray coming off the falls. 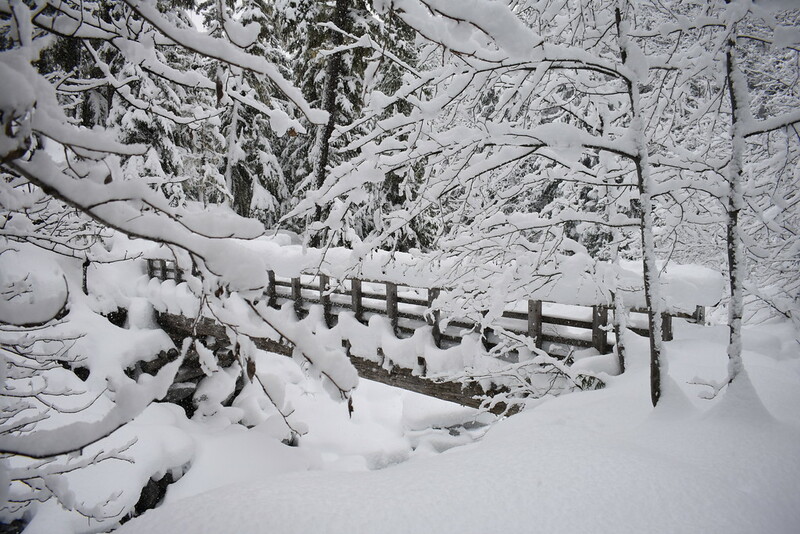 Whistler receives over 11m of snowfall on average. Winter is an amazing place to spend a day, a week, or a whole season. But if you only have one day or you don’t ski or snowboard you can also take in the epic views you can still sightsee on Whistler Blackcomb Mountain resort by taking the gondola up. 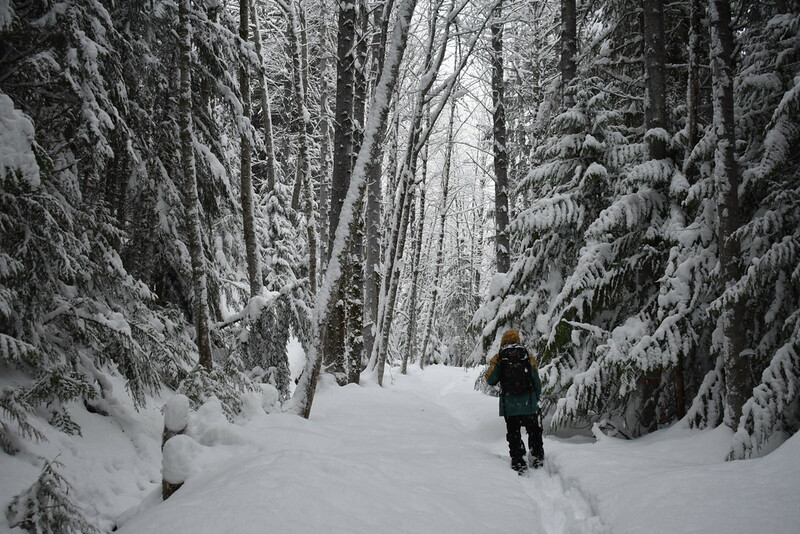 Alternatively you can go snowshoeing through the forest by Alta Lake. Or head over to Alta Lake itself for a stroll along the lake. 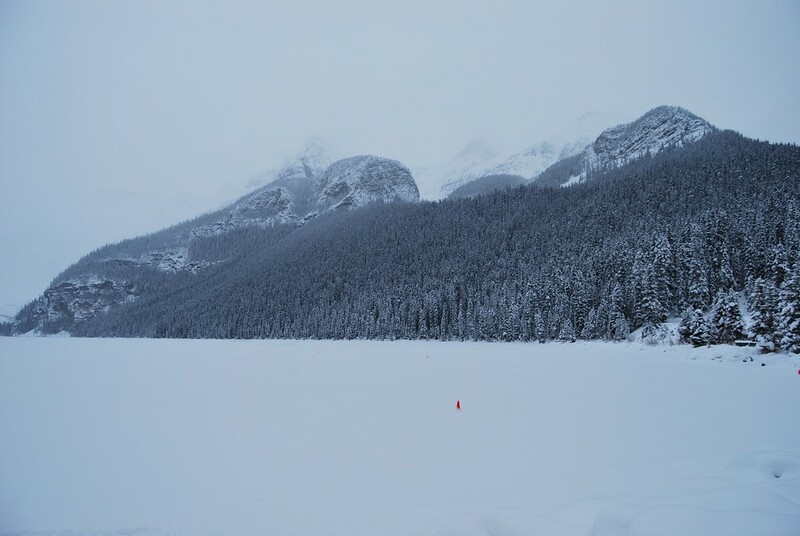 If the ice is thick enough, you can walk on the lake itself, do exercise caution though as you do not want to go for a icy dip. 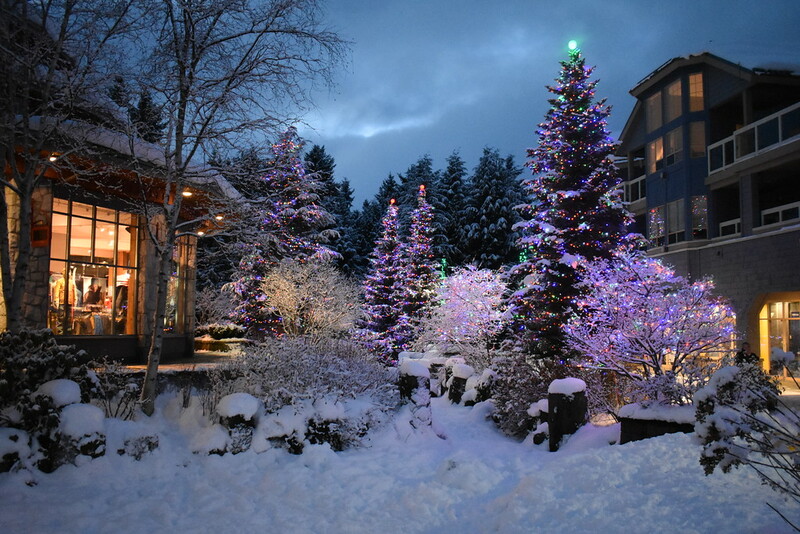 At night, wander through the resort village under the glow of the fairy lights. After getting your fill of snow in Whistler, it’s time to continue North. 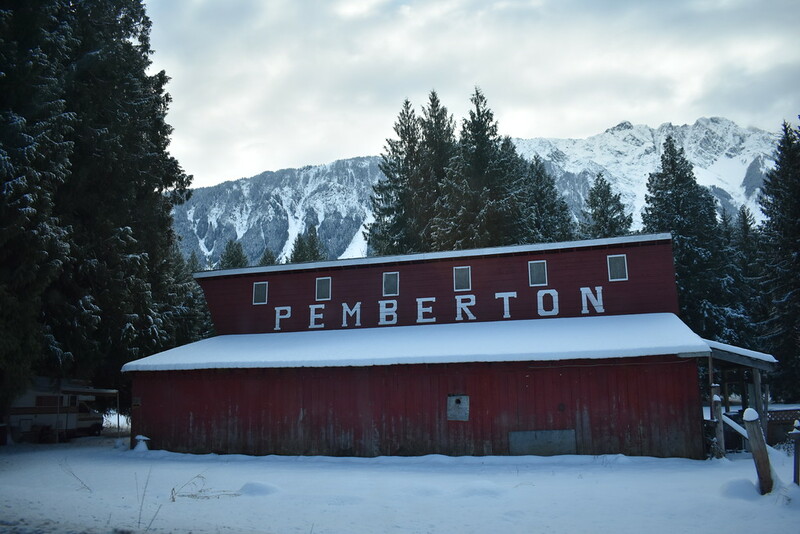 Only a half hour away from Whistler is Pemberton, a coastal mountain village with a peaceful atmosphere, especially compared to bustling Whistler. Continuing East you will arrive at Joffe Lakes Provincial Park. It’s a short jaunt from the parking lot to the first lake. 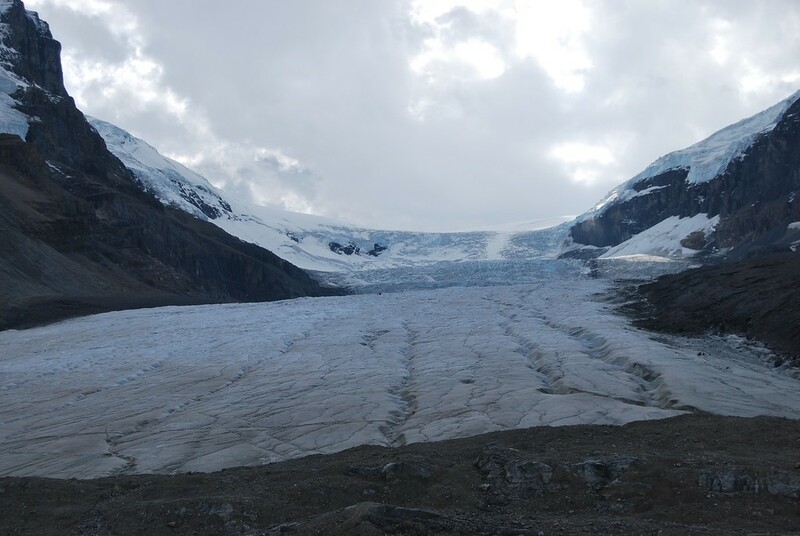 We ventured out onto the thick ice and watched the clouds move around glaciated Joffre Peak. 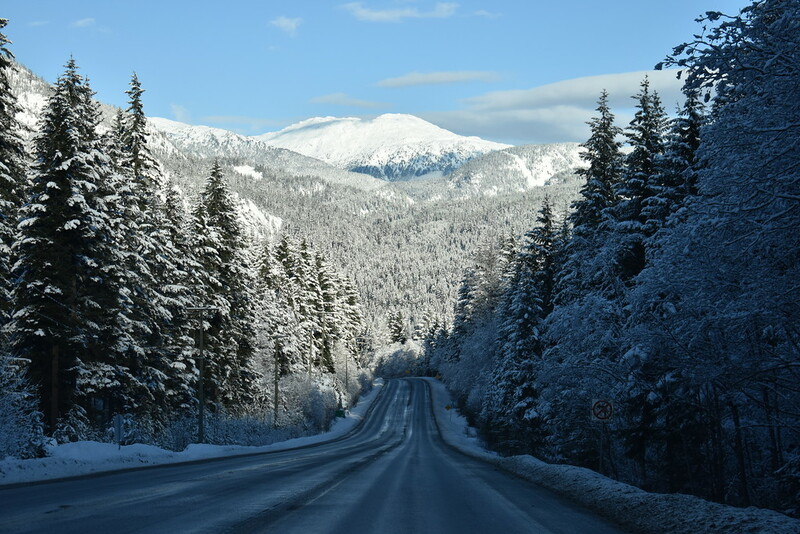 Continuing North on Route 99 brings us to jaw dropping views of the wild, rugged coastal mountains endowed in snow. 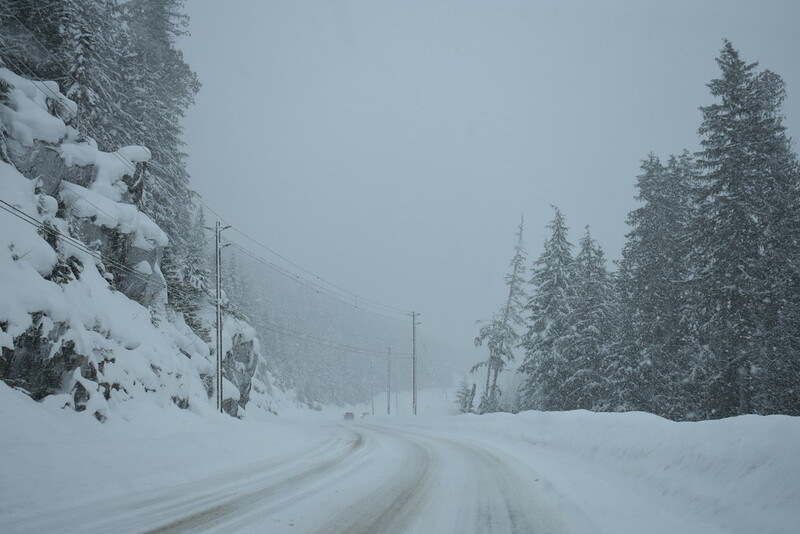 Route 99 North of Whistler can be a difficult and dangerous road to drive on if weather and road conditions are unfavourable. Stretch your legs at Seton Lake before passing through the former gold mining town, Lillooet along the Fraser Canyon. 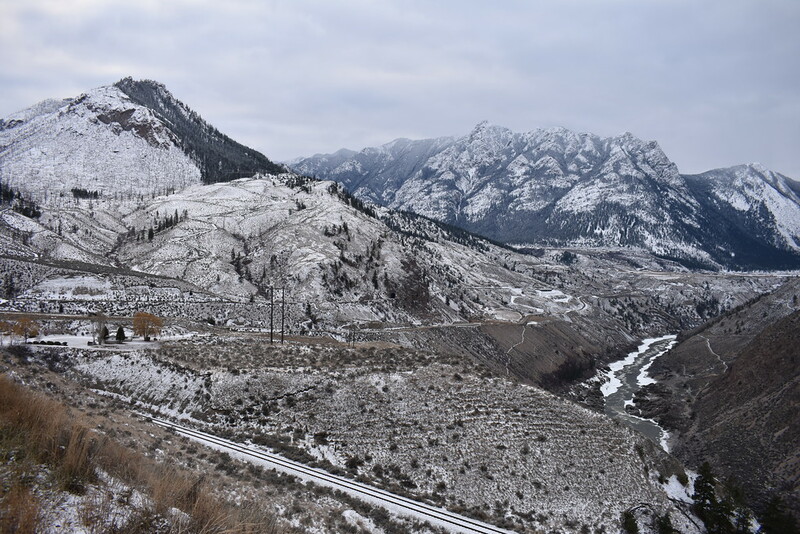 From Lillooet, continue along Route 99 until the junction with Route 97. 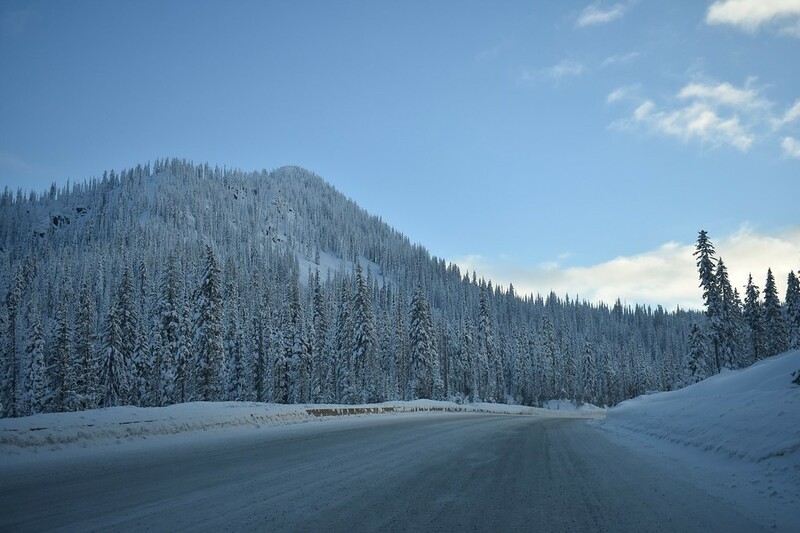 Go South to meet up with the TransCanada Highway 1 towards Kamloops. 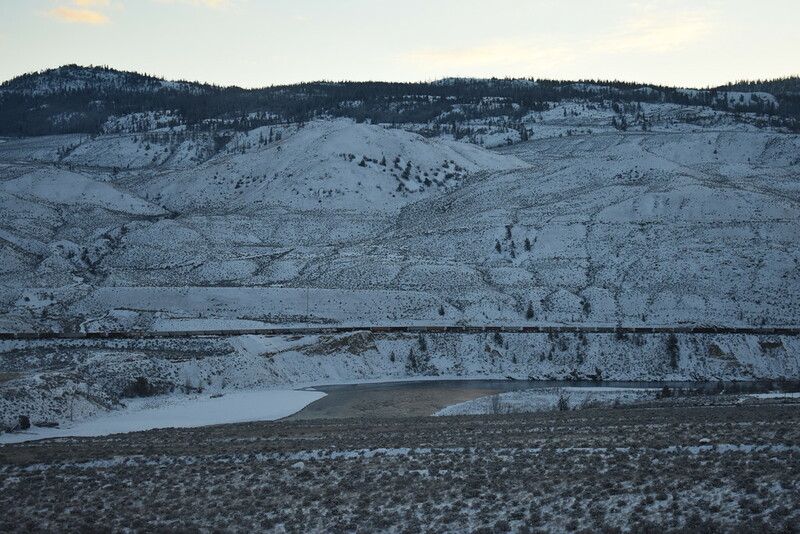 Seemingly endlessly long trains travelling across the side of the hills on the Southern side of the Thompson river are frequently seen chugging along, heading to the next rural B.C town carrying goods and occasionally passengers. Before descending into Kamloops pull off into one of the viewpoints overlooking the town and Kamloops Lake. It’s particularly scenic when arriving at twilight. 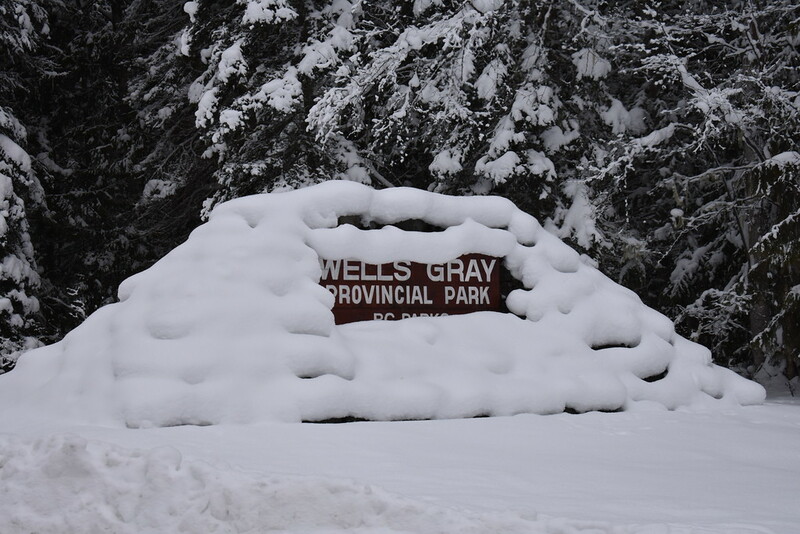 We elected to base ourselves in Kamloops and take a day trip to Wells Gray Provincial Park rather than finding a room in Clearwater. There is a considerably wider selection of restaurants and shops in Kamloops than you would find in Clearwater. We were there around Christmastime and while most places were closed we still managed to find a few places open for food and drinks. 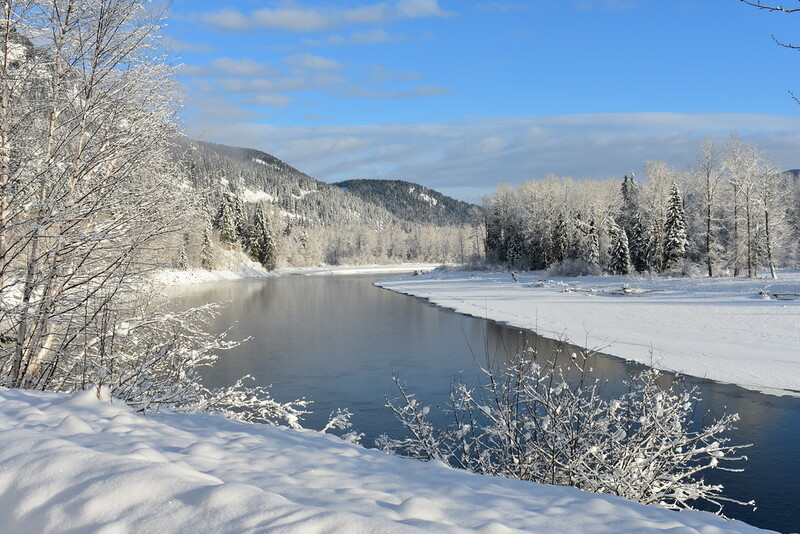 Jonas had previously visited Wells Gray Provincial Park in the summer on a family road trip and was eager to return, particularly as winter would showcase the wilderness area in a different light- one enveloped in a thick veil of snow. 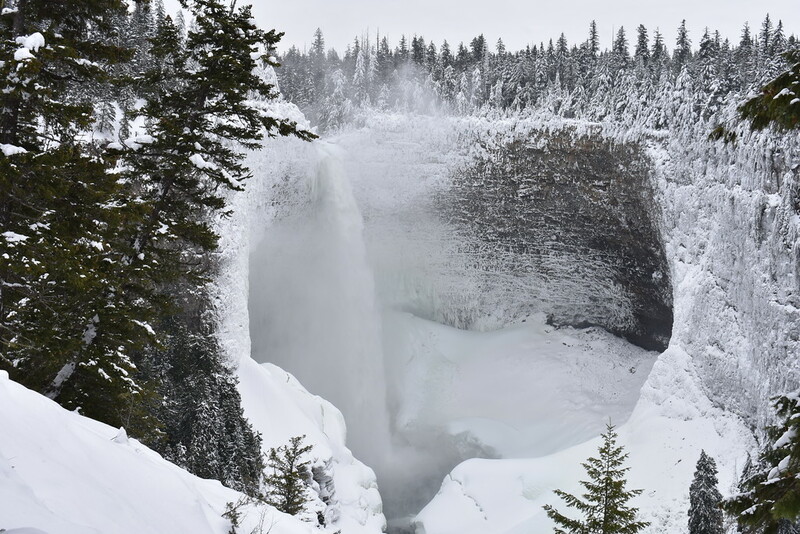 The biggest draw in the park is 141m waterfall, Helmcken Falls, the fourth largest waterfall in Canada and certainly one of the most spectacular- in any season. 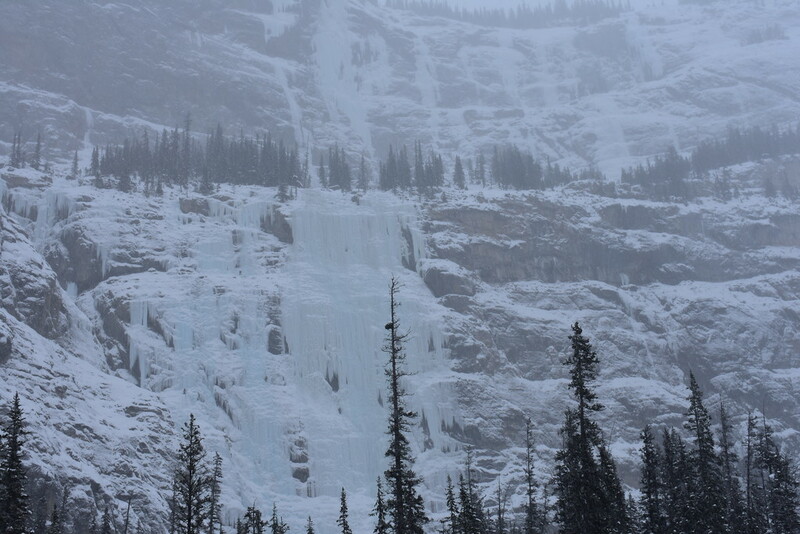 This waterfall doesn’t freeze over in winter but the spray from the falls certainly does and dramatically coats the surrounding cliff canyon walls in ice. There are currently 39 known waterfalls in Wells Gray Country. 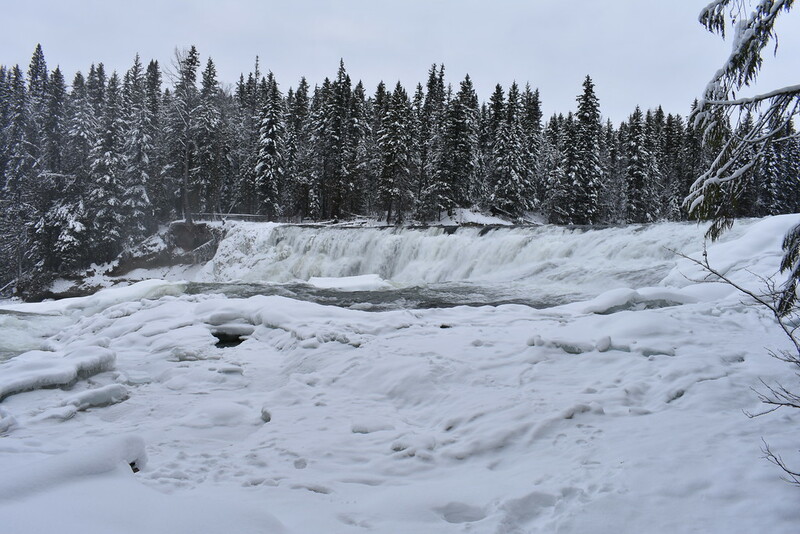 The most accessible falls to view in winter are Spahats Falls, Dawson Falls, and Helcken Falls. 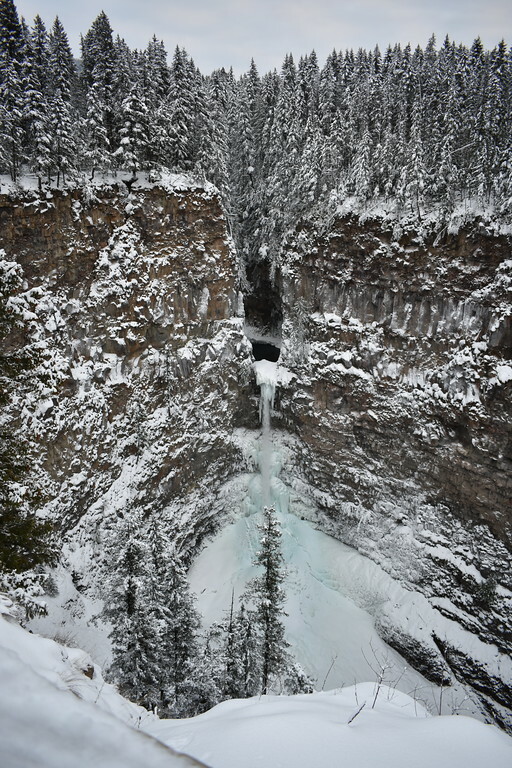 From the town of Clearwater proceed North along Clearwater Valley Road and Helmcken Falls Road to reach the three aforementioned falls. It is 10.7km to Spahats Falls, 30.2km past Sphats for Dawson Fall, and then only 5.8km further from Dawson to Helmcken Falls. 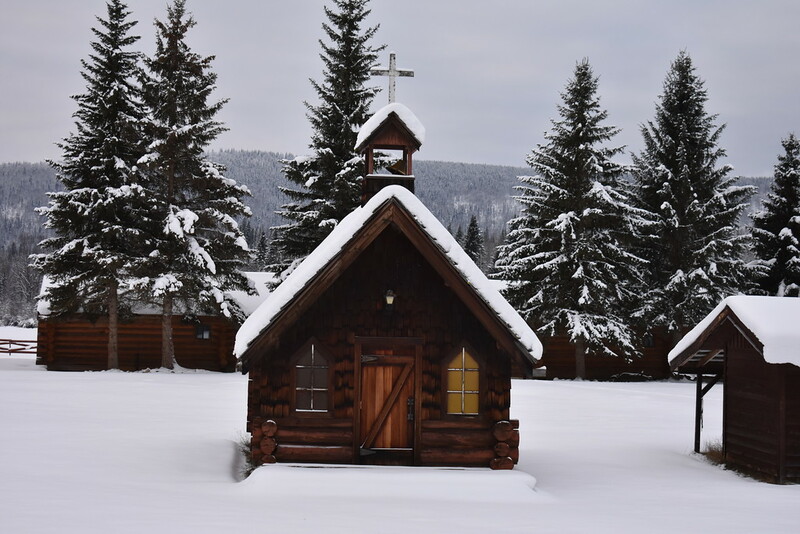 A photogenic pocket sized wooden church lies along Clearwater Valley Road on the Wells Gray Guest Ranch property and is visible for the road. Makes for a quick photo op before heading back to Clearwater. After a stellar time in the coastal mountains of British Columbia it’s time to head into the Canadian Rockies. Driving distance today will be 441km departing from Kamloops and finishing in Jasper. 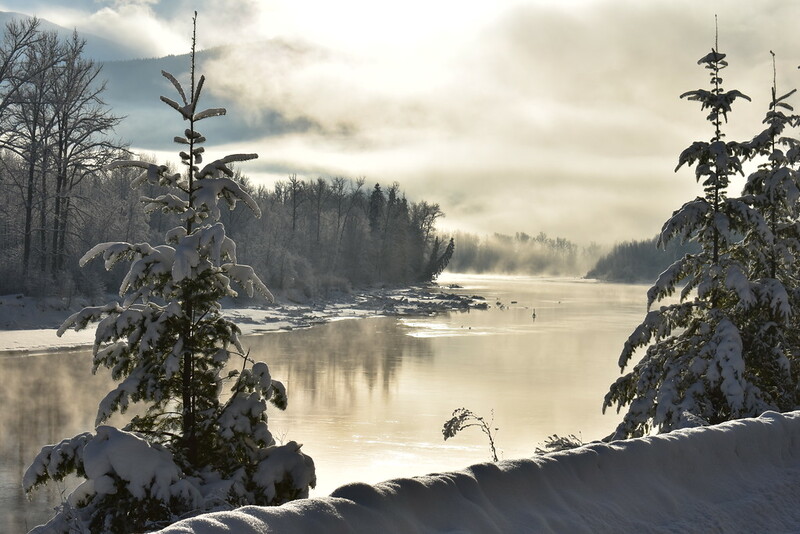 The North Thompson River along the way is beautiful in the mornings when the sun carresses the clouds of steam rising above the partially frozen river creating an ethereal scene. 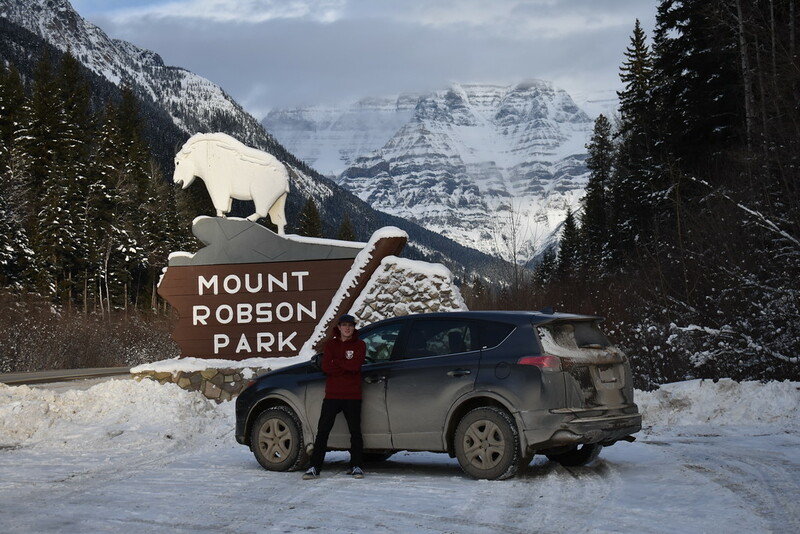 Just before you reach the Alberta – British Columbia Border stop in Mount Robson Provincial Park to gawk at the bold and beautiful Mount Robson. 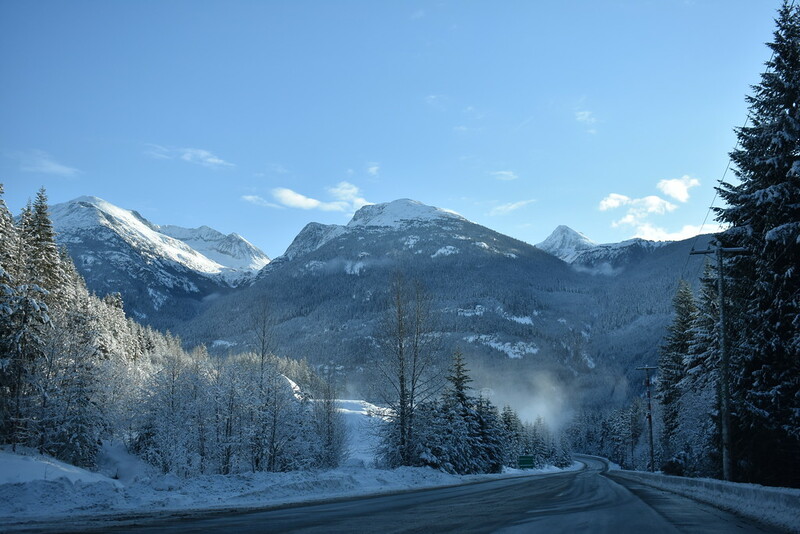 The best views are along Yellowhead Highway or Highway 16 just before you reach the visitor center. If, when you arrive in Jasper you still have some daylight on your side drive up to Patricia and Pyramid Lakes. 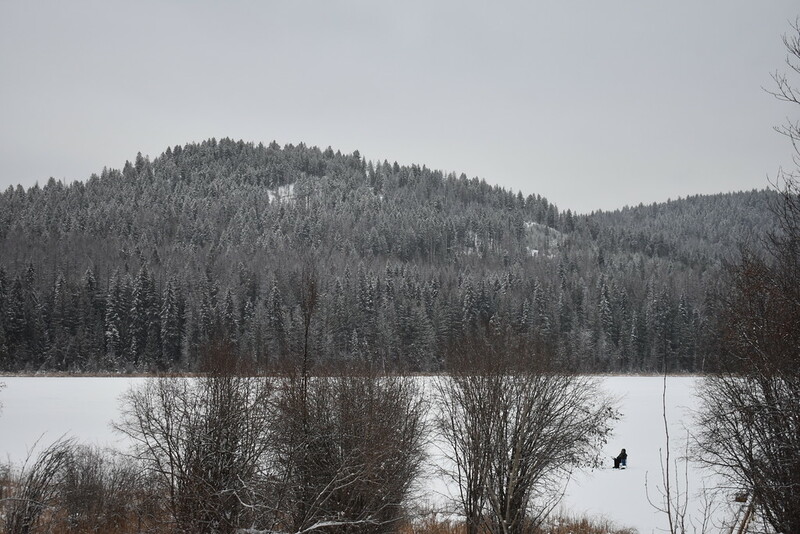 In winter people cross country ski, snowshoe, or skate on the frozen lakes. 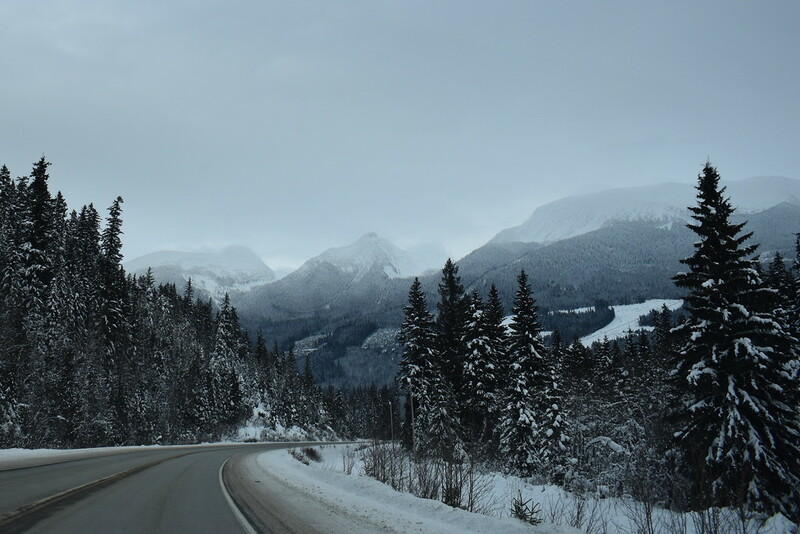 From Jasper town head North onto Yellow Highway then turn onto Maligne Lake Road. 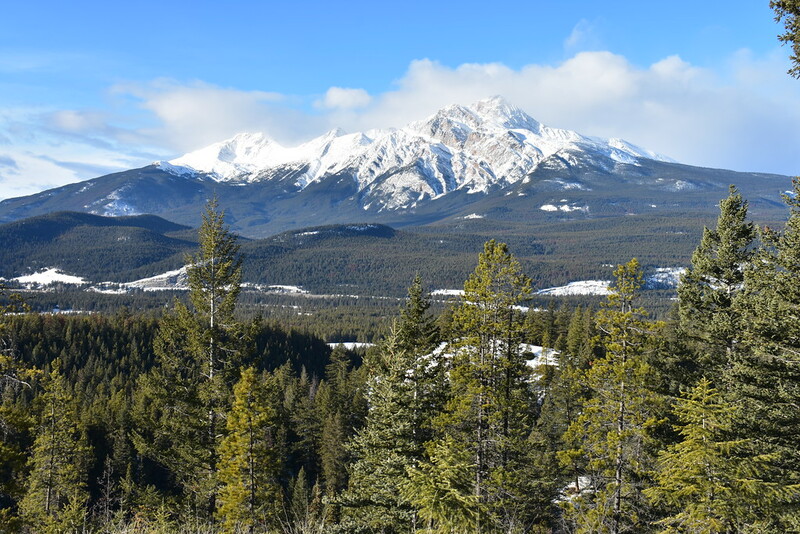 Stop at the Maligne Lake Lookout for views of valley view towards Jasper. 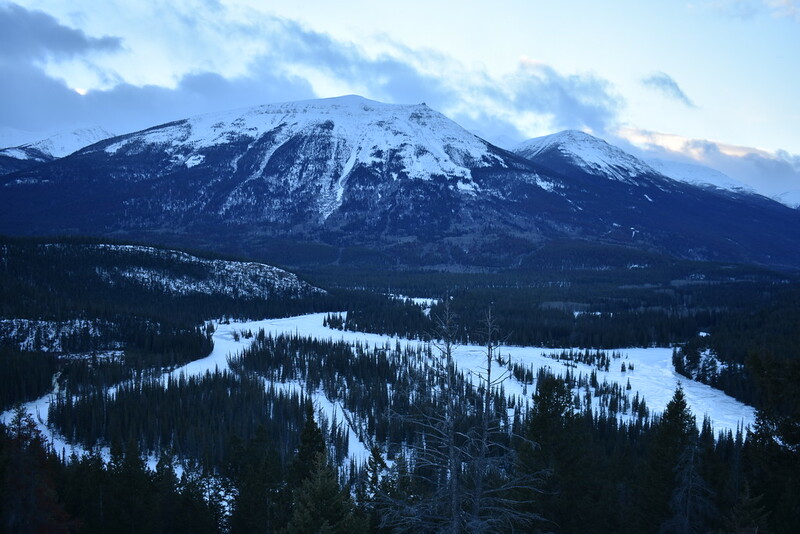 Then get back on Maligne Lake Road and turn off at the next exit for Maligne Canyon. 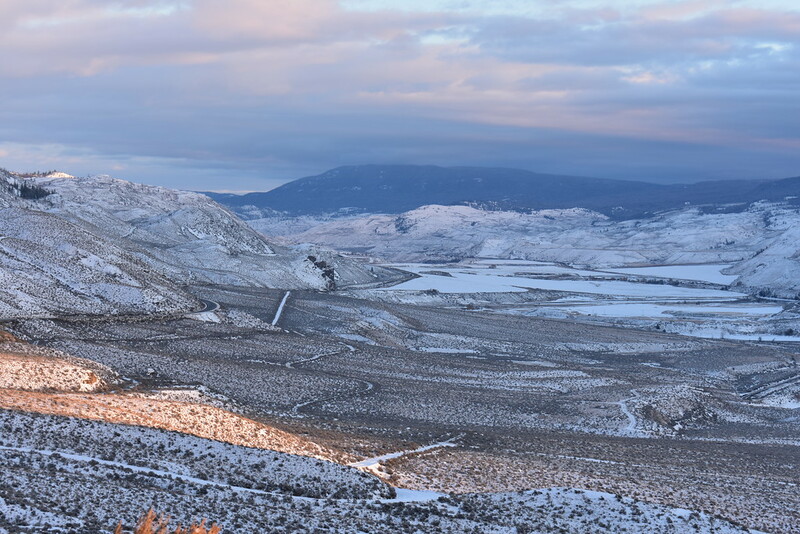 This limestone canyon is connected by a series of bridges, which are great vantage points for viewing its steep walls, and frozen river and waterfalls. 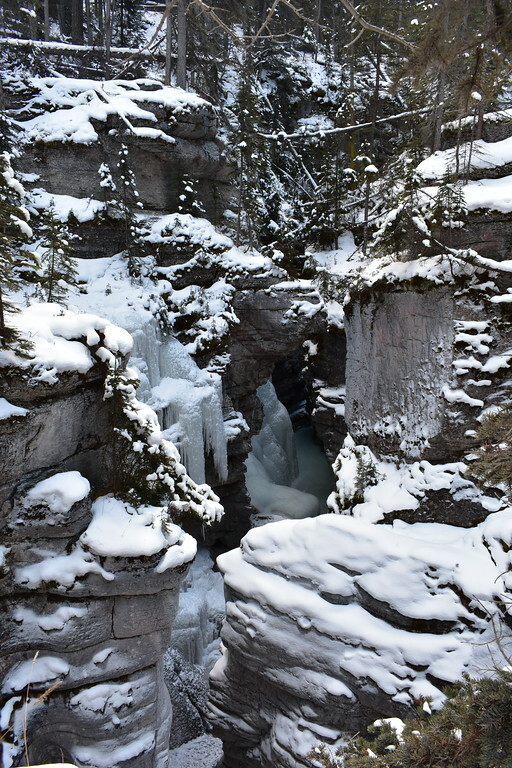 A popular winter activity is to explore the canyon from below. You can rent a pair of crampons in town and wander on the ice on your own or join a guided group. If you are very careful and/or don’t mind falling you can attempt it in hiking boots as well. We made it but crampons would have been helpful! 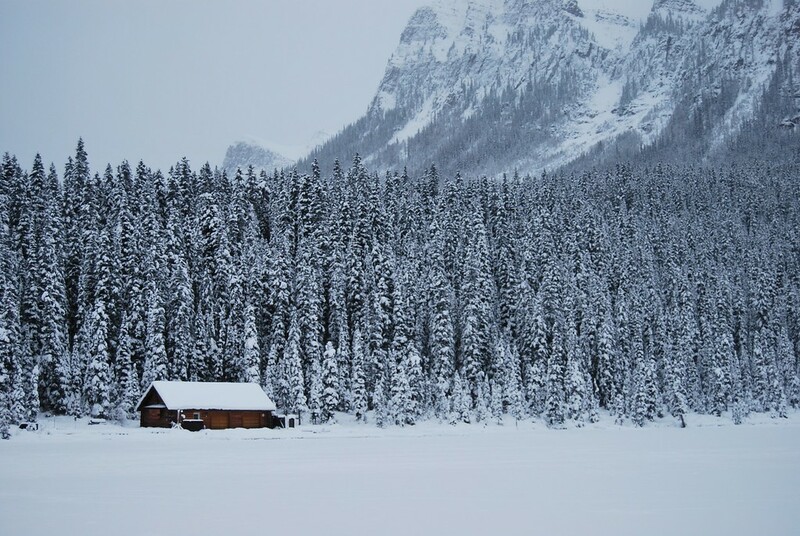 15km further along Maligne Lake Road you will reach Medicine Lake. Forest fires in recent years have burnt the surrounding forests and forges a melancholy atmosphere. 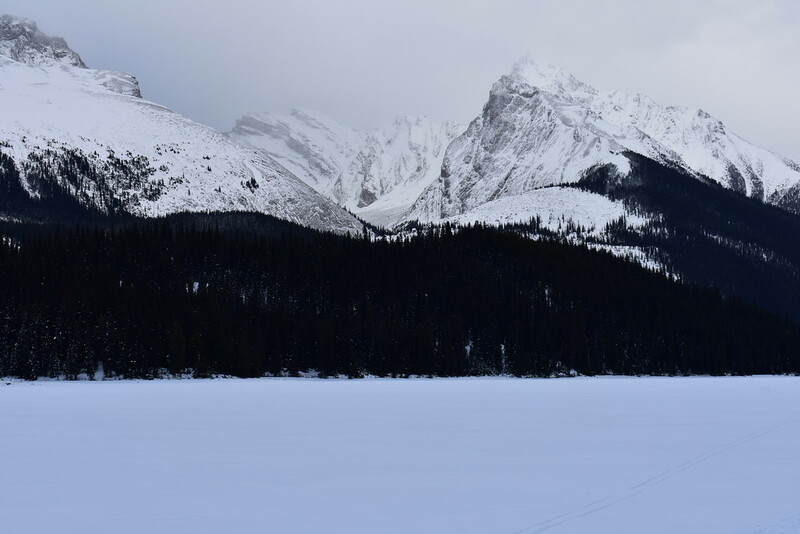 Another 31km brings you to the iconic Maligne Lake. 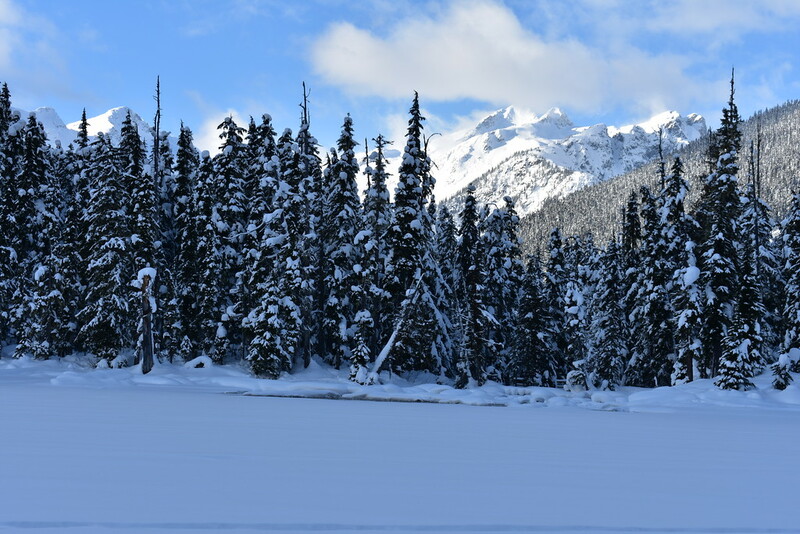 Similarly to Patricia and Pyramid Lakes, you can walk, ski or snowshoe along or across this stunning lake. 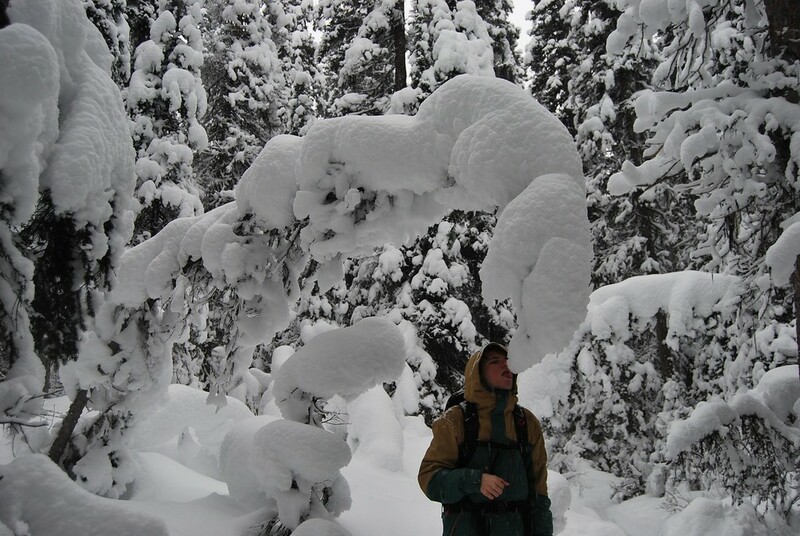 Alternatively you can walk or snowshoe through the peaceful forests on either side of Maligne Lake We choose a lesiurely snowshoe around the Moose Lake Loop. In winter you don’t have to worry about running into bears as they are hibernating. Fast, high energy travellers with an extra day will find Bald Hills to be a rewarding work out. Our favorite hike by Jasper town is on Old Fort Point Road. 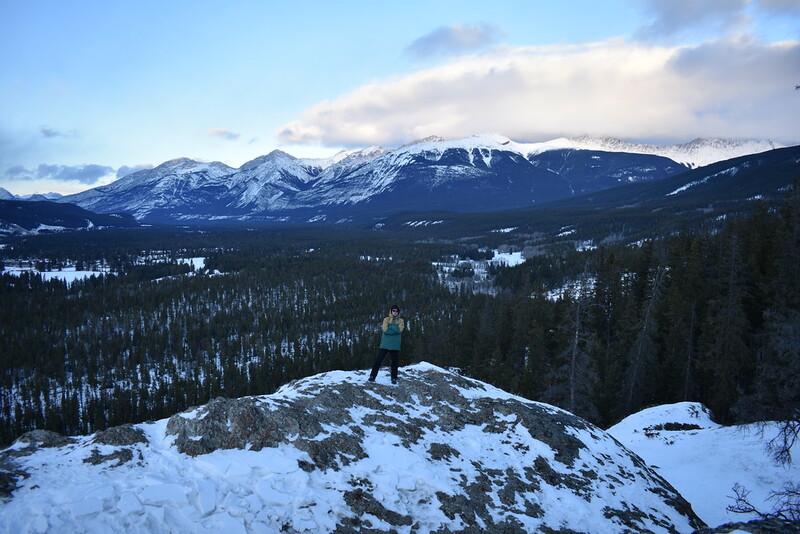 Walk up a set of stairs to a lookout point over the Athabasca River. You can then either walk next to the river on the Valley of the Five Lakes trail or walk uphill on the Old Fort Loop Trail. 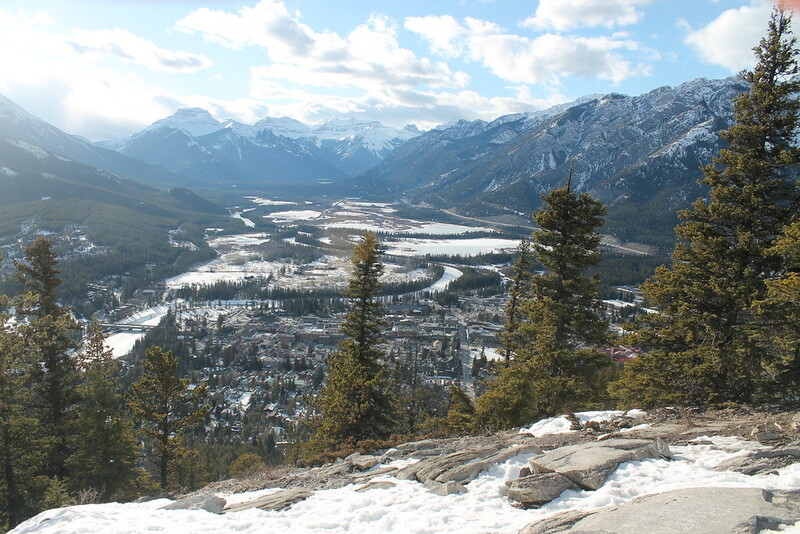 A short, steep 500m into the Fort Loop trail brings you to a stunning vista point with sweeping views of the valley and Jasper town set against a backdrop of snow capped peaks. 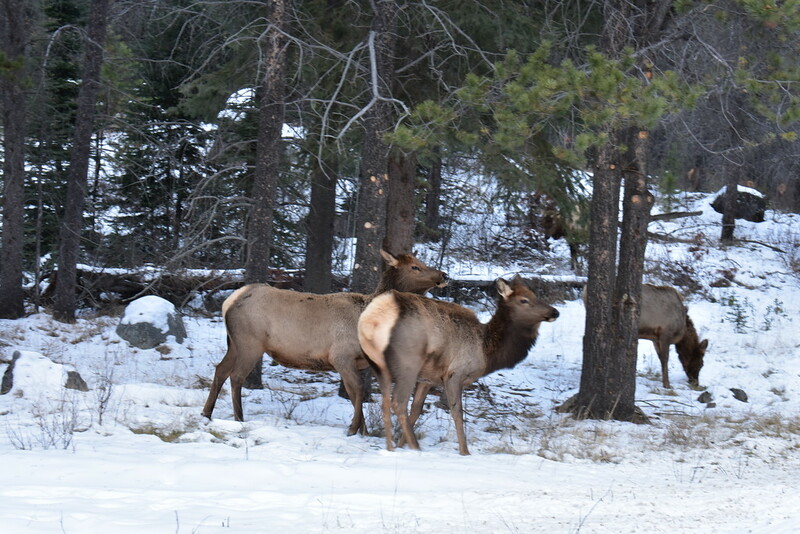 Keep your eyes peeled for wildlife in and around town. 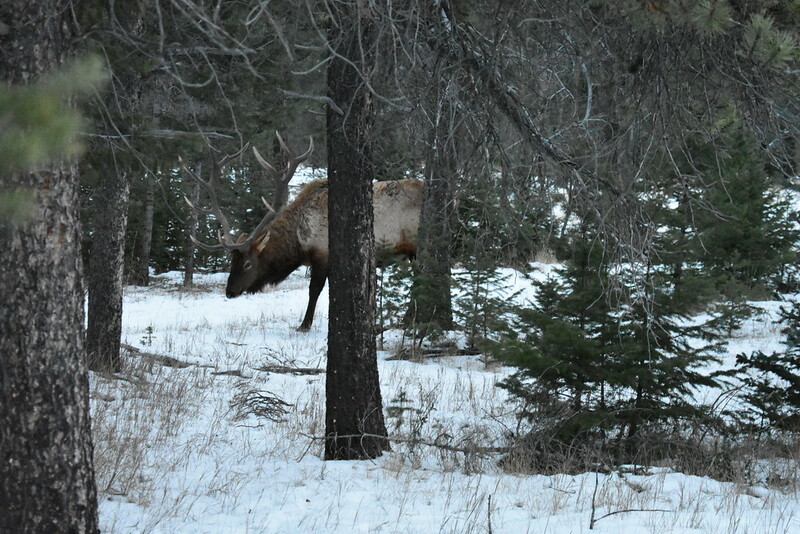 It isn’t uncommon to see caribou or deer and occasionally moose in winter by the road. It is unwise to get too close or attempt to feed the animals. 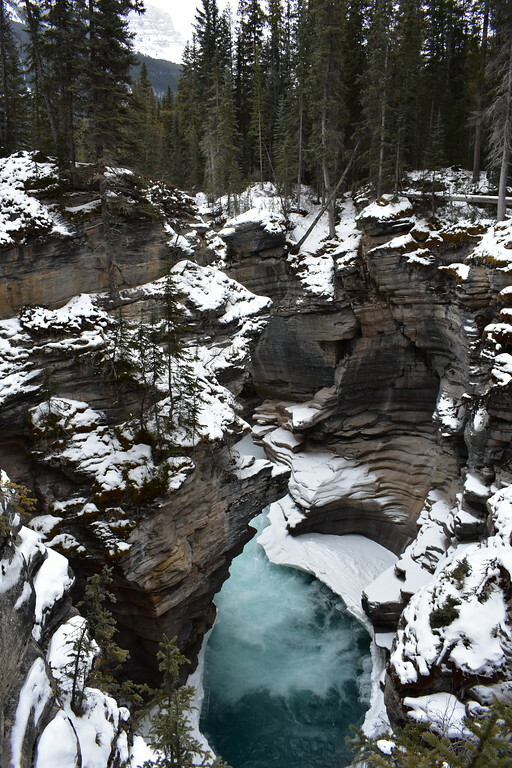 A half an hour drive South of Jasper on the Icefields Parkway are the Athabasca Falls, at 23m high and 18m wide. Though the falls may be short in statue, they make up for it in the impressive volume of water pummelling over the quartzite cliffs and into the limestone gorge. The final day of this two week Western Canada road trip starts in Jasper and ends in Calgary, one of the most liveable cities in the world. 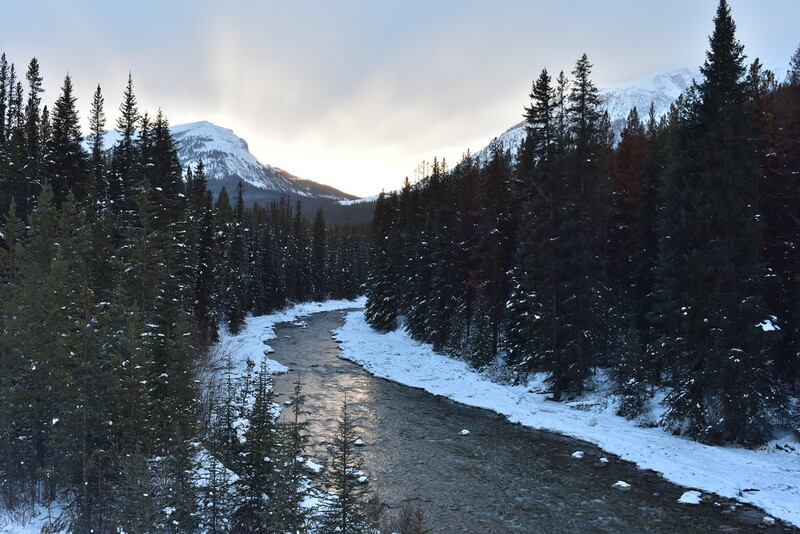 This will be a driving day punctured with numerous stops as photo opportunities abound along the Icefields Parkway between Jasper and Lake Louise and TransCanada Highway 1 linking Lake Louise to Calgary. 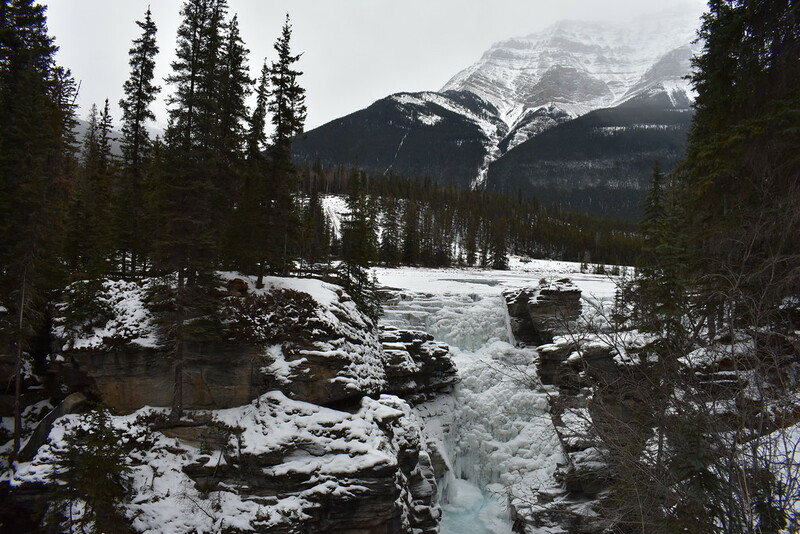 Since we visited Athabasca Falls during our time in Jasper cruise on by to Sunwapta falls, a graceful set of falls descending a height of 18m and partially frozen in winter. 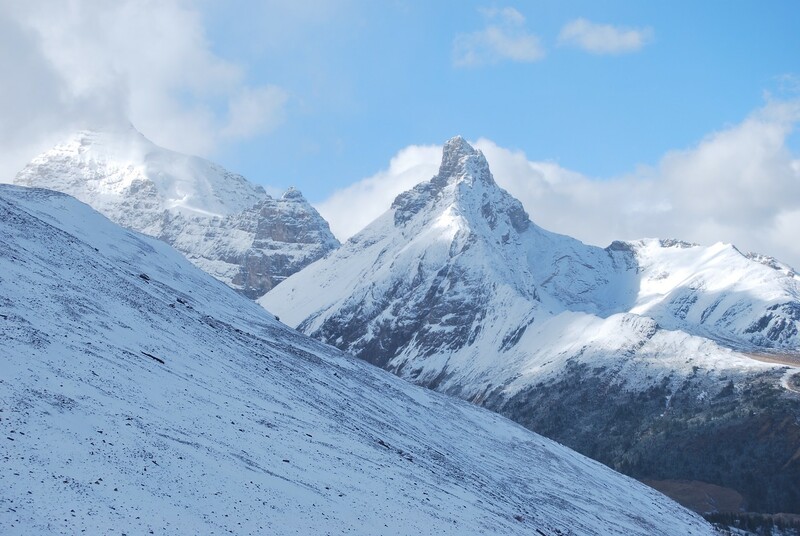 As you approach the border between Jasper National Park and Banff National Park, make a stop at the Columbia Icefield. 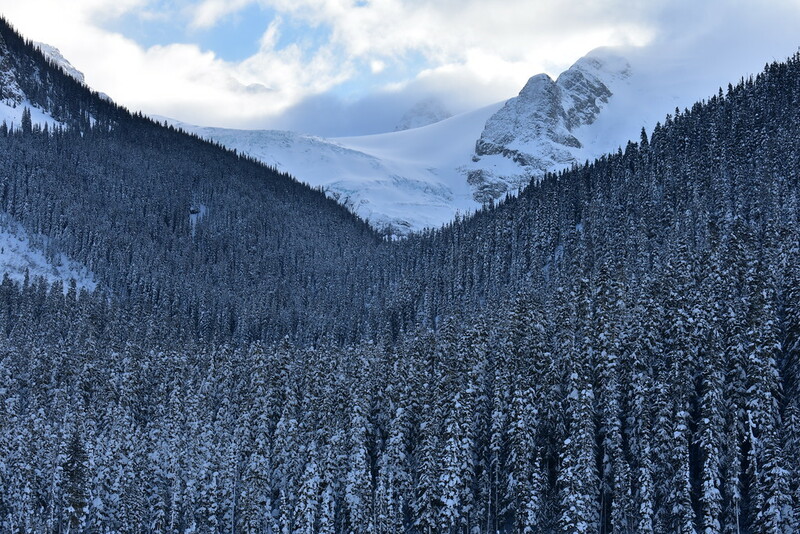 With an area of 325 km squared, this is the largest icefield in the North American Rockies. 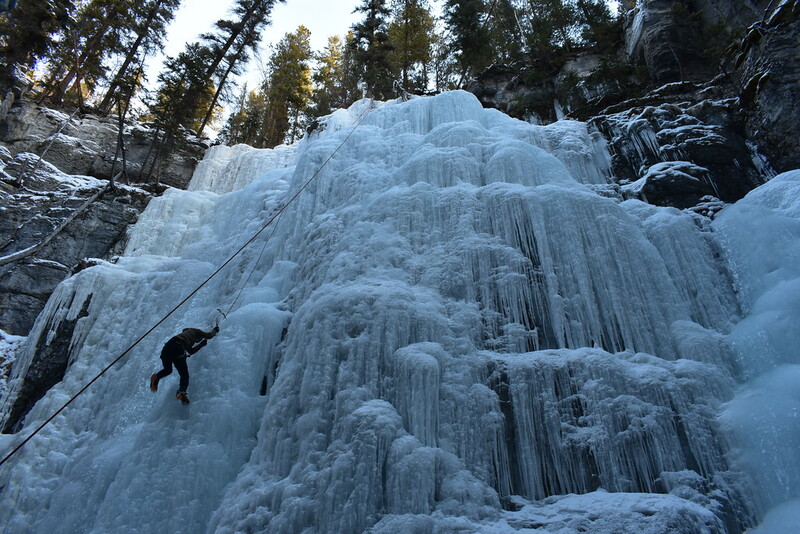 After the Columbia Icefields cross over into Banff National Park and stop to marvel at the ice climbers tackling the frozen waterfalls on the Weeping Wall of Cirrus Mountain. From the highway the climbers look like ants! Can you spot the ice climbers? 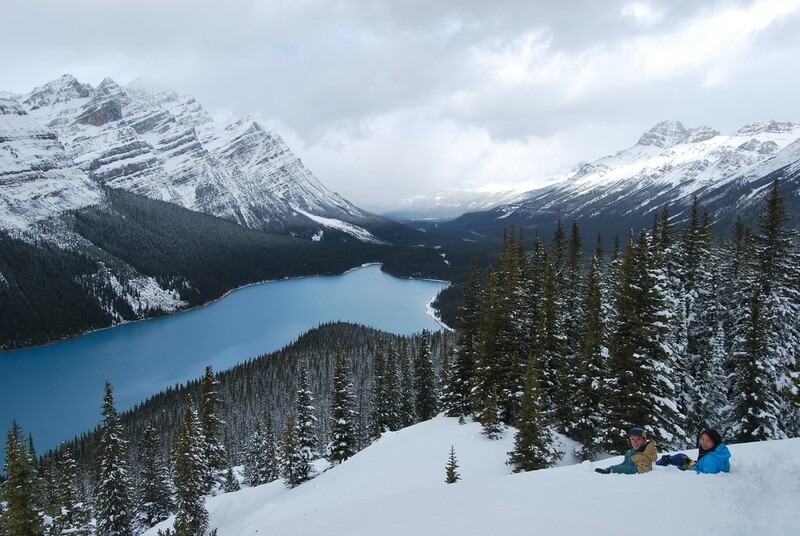 Next up is Peyto Lake, one of the most photographed lakes in the Canadian Rockies. Get out at the Bow Summit parking lot and walk to the Peyto Lake overlook point. Can you spot the outline of a wolf’s head in the three prong outline of this turquoise glacier fed lake? 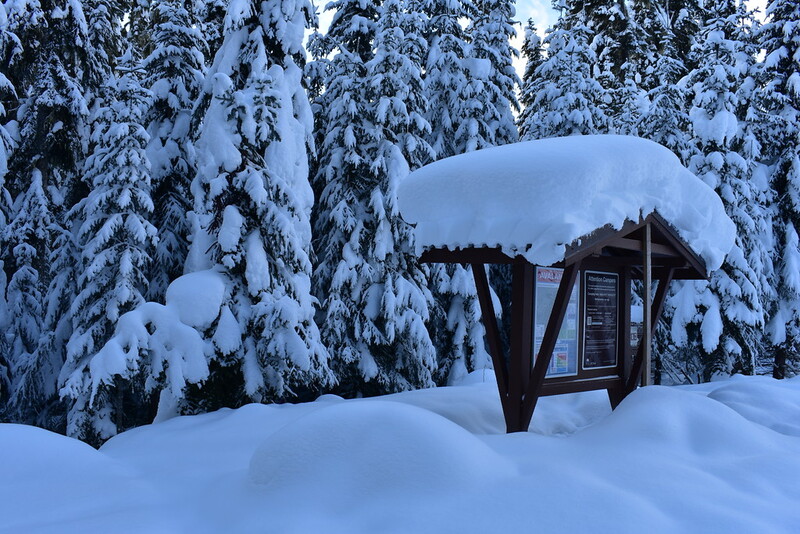 If you have snowshoes on hand you can explore the snow and the forest past the wooden lookout point. 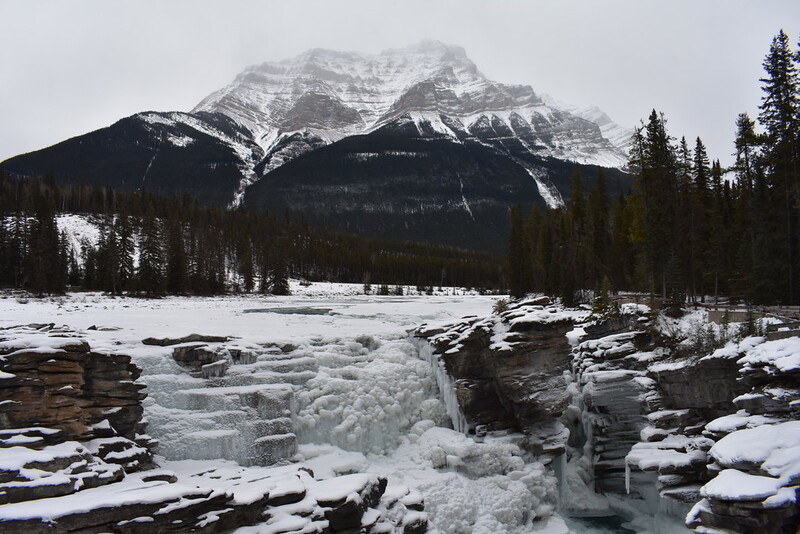 Finish off your time on the Icefields Parkway with a stop at Bow Lake to admire several glaciers at once, the Crowfoot Glacier, Bow Glacier, and Wapta Icefield. Merge onto Highway 1 towards the tiny town of Lake Louise. Two incredibly photogenic lakes, Lake Louise and Moraine Lake, reside nearby but only Lake Louise is accessible by car in winter. 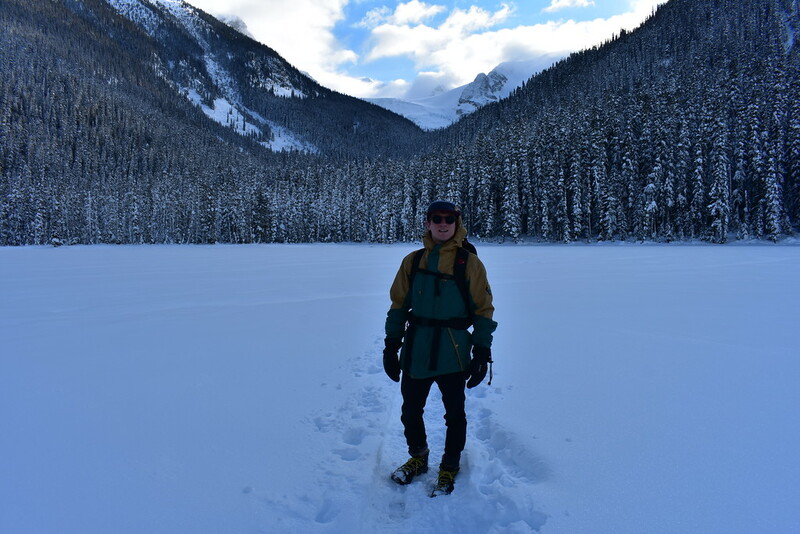 Take a short walk along Lake Louise or get on the ice itself. Every January the Lake Louise Fairmont holds an annual ice sculpture competition and maintains an ice rink and recreational skating area. 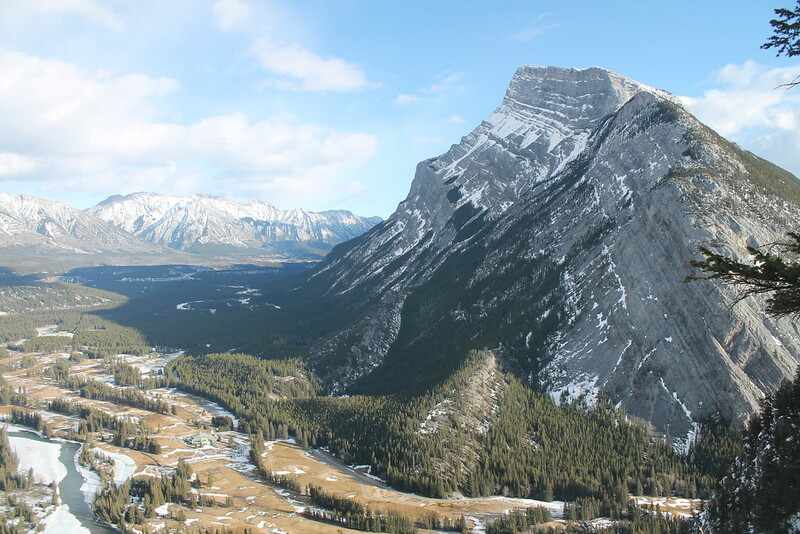 Following Lake Louise, pop into Banff town and walk along Banff Avenue, where you are treated with incredible views of Cascade Mountain. After a long day of driving, why not treat yourselves to a dip in the thermal mineral waters of the Banff Upper Hot Springs or take the switchbacks up Tunnel Mountain, Banff’s shortest summit, for excellent sunset views overlooking the Bow and Spray Valleys.. After your short but sweet visit to Banff it’s time to get back on the TransCanada Highway 1 and gradually wave goodbye to the Rocky Mountains as you coast through the foothills and prairies back to Calgary. If you think two weeks isn’t nearly enough time to explore Western Canada, we would agree with you! However, if you only have two weeks this itinerary can help you make the most of it in this short time frame. If you found this post helpful please share with others! If you have questions or comments you can ask us or tell us in the comments below! Make planning easier, pin this post for later!